Since the start of January KonMari fever has been sweeping the nation. The latest trend of #newyearnewme has seen people getting rid of their possessions by the bin load. If you’re one of the few who have escaped the Kondo frenzy here’s what you need to know. Marie Kondo is a Japanese tidying guru and the bestselling author of ‘The Life Changing Magic of Tidying’ and ‘Spark Joy’. Through her books and her consultation business, Marie teaches people how to tidy their homes once and for all. Her KonMari method relies on the principle of keeping only the items in your life that spark joy. By taking each and every object that you own into your hands and passing it through the ‘joy check’ you can create an ideal life in which everything you own sparks joy. This January, Netflix viewers watched in awe as Marie helped to transform the lives of her clients by simply tidying up. Despite having a band of loyal followers and cult of Kondo converts, the show and Marie’s method have not gone un-criticised. Collectors and maximalists alike have pushed back against the suggestion that minimalism will make us all happy. The fact remains that despite the image presented on Pinterest and Instagram, living in a show home will not bring us all joy. But Kondo understands that. In fact, it’s precisely what she’s saying. Many of the naysayers who have taken to criticising the advice presented in the Netflix show have not taken on board the main point of the KonMari method: that you must keep whatever sparks joy. For a minimalist this may be very little. However, for a maximalist this can be as much as you like. 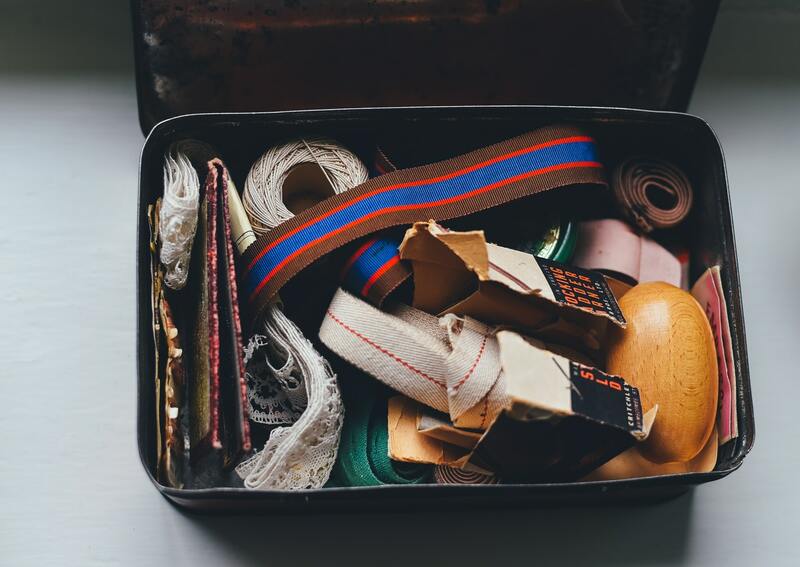 So without further ado, here’s our top tips on how to KonMari as a Maximalist and spark joy with your antiques. The first step of the KonMari method is to discard, by category, all items which do not bring you joy. Starting with clothes and working your way through books, miscellaneous “komono” and sentimental items, at the end you should be left with only those things which spark joy for you. The next step in the method is working out where to store your joyful items. Marie Kondo recommends storing like with like so that even the smallest of items are easy to find. This can sometimes be a struggle in modern drawers which are wide and spacious and require dividers if things are to be kept neat and tidy. Fortunately, with their quirky compartments and small drawers, antique furniture can provide the perfect KonMarie solution to clearing up your komono and keeping your home full of character. Tiny draw cabinets like the one shown below can provide a perfect solution for stationary storage, nails and screws or even work as a medicine cabinet. 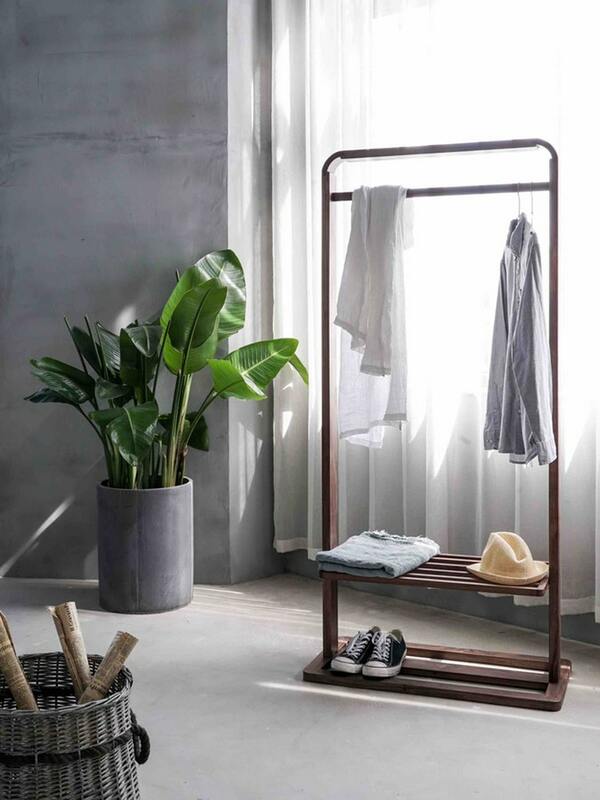 When it looks this good you don’t have to worry about hiding your storage solutions away - present them proudly in a convenient and aesthetically pleasing place. If you’re a lover of antiques - and especially if you frequent any of the UK’s plethora of antique fairs - it is likely you will have accumulated a lot of treasures. Having a lot of items needn’t be a burden on your space though. Simply make sure that each and every item is displayed or used to spark joy in your life, so that you can get the most out of your prized possessions. When collecting trunks and unusual pieces of furniture the temptation may be to place them in a corner or out of the way so as not to impose on the rest of the house. Although this may seem the most practical solution for daily life, it won’t necessarily help to spark joy. Unless you’re a dealer planning on selling on your antiques, then they’re there to be used and enjoyed! So dust off the cobwebs and get creative. 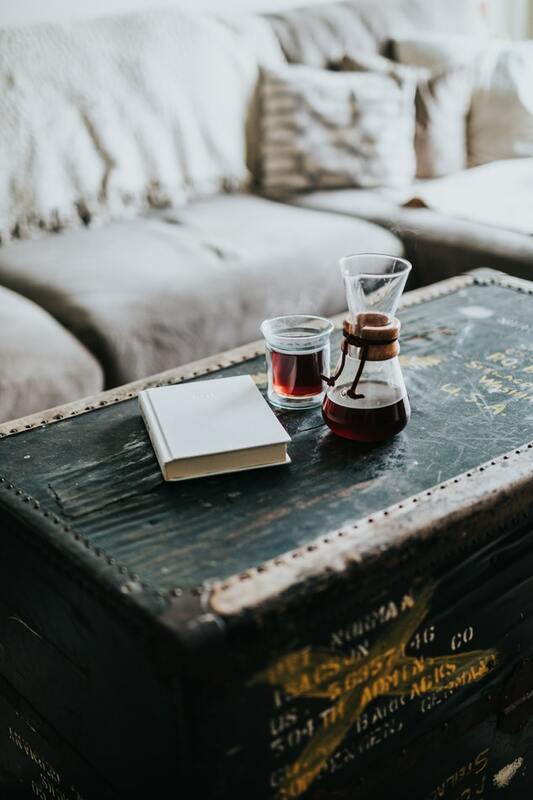 We love using trunks as coffee tables. Not only do their interiors make the perfect space to store board games and blankets, they also make a striking addition to any lounge and provide a focal point to gather friends and family around. One of our favourite Kondoisms is the practice of unpacking your bag at the end of every day. If you’re a maximalist and have a lot of bags, then this tip can save so much time and help keep your accessories looking their best. At the end of every day be sure to completely empty your bag and put your essentials all in one place, wash out your coffee cup and put any moisturiser or cosmetics back in their place. Then you can give your bag a quick dust down, thank it for all its hard work and put it back in its place. Then if you go for a different look the next day you can pack your new bag with ease. An old fashioned writing bureau or keyhole desk makes the perfect place to store your daily essentials and makes a striking addition to the hallway. Vintage tins and jars are a firm favourite of amateur and professional collectors alike. Whether they remind you of your grandma’s house or their colourful imagery just speaks to you, why not put them to use? The pleasure of owning these pieces will multiply if you give them a purpose and a reason to shine too. Maybe you have an old Tetley tea tin or you’ve inherited a selection of vintage tobacco tins. Rather than being additional clutter these heirlooms are actually the perfect receptacle to help organise your home. Not only do they look great, it’s also a much more eco-friendly option than going to a homeware store to buy new dividers! Use tins in dry areas and for items that aren’t liable to leak so that you can keep your tins from rusting. They make great sewing boxes or a neat place to keep all your shoe care products. If you’ve got a selection of wooden boxes you can use these in the kitchen to keep your oils and spices organised and easy to access. Anything that sparks joy can be a welcome addition to your home. Having a check of what is meaningful in your life doesn’t mean getting rid of everything you own. You can still keep hold of the items you cherish and create a harmonious, tidy home. 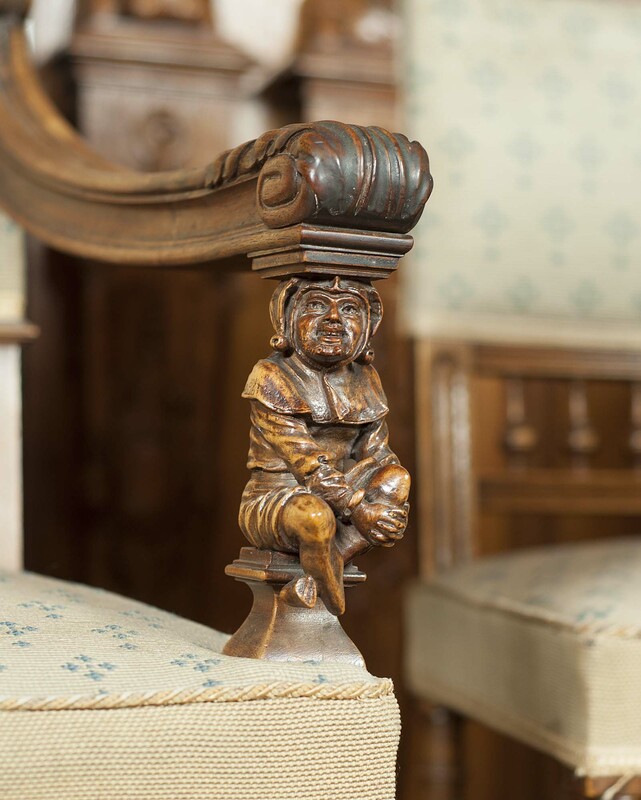 When collecting antiques it can be easy to put them on a pedestal above other types of furniture or decoration. But putting your antiques to use can give them a new lease of life! We’ve enjoyed exploring how the principles of KonMari can work for a maximalist interior full of colour, texture and, most importantly, joy! We hope this has inspired you to see how even as a maximalist you can KonMari your home using your antiques. Festive traditions are all part of the joy of Christmas, whether they are customs inherited from the family or those that have culturally transported through the years. However, Christmas conventions have evolved over time, and like everything, seasonal fashions come and go. If you’re wondering how to inject a little vintage Christmas into your home this year, we’ve put together some ideas to help you bring the past into the present this December. 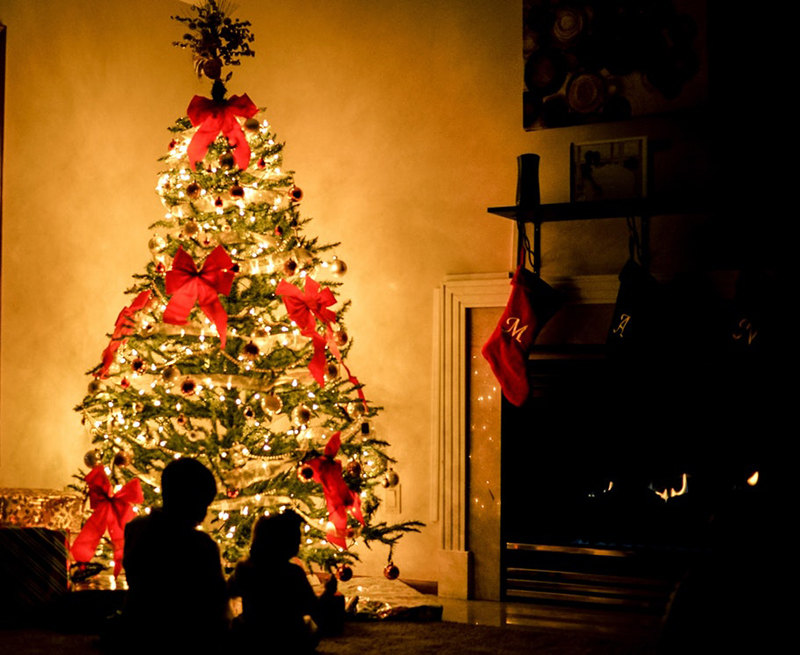 Often the Christmas tree is the centre point of the home, and this has been the case for centuries. 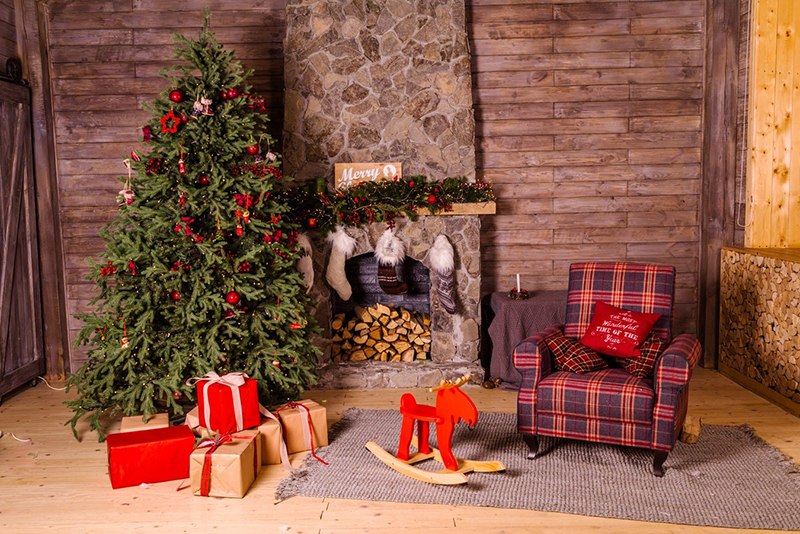 If decorating your evergreen is something you look forward to every year, you won’t be alone, and while tastes have certainly changed over the decades, that’s not to say you can’t bring back some retro decorative styles. 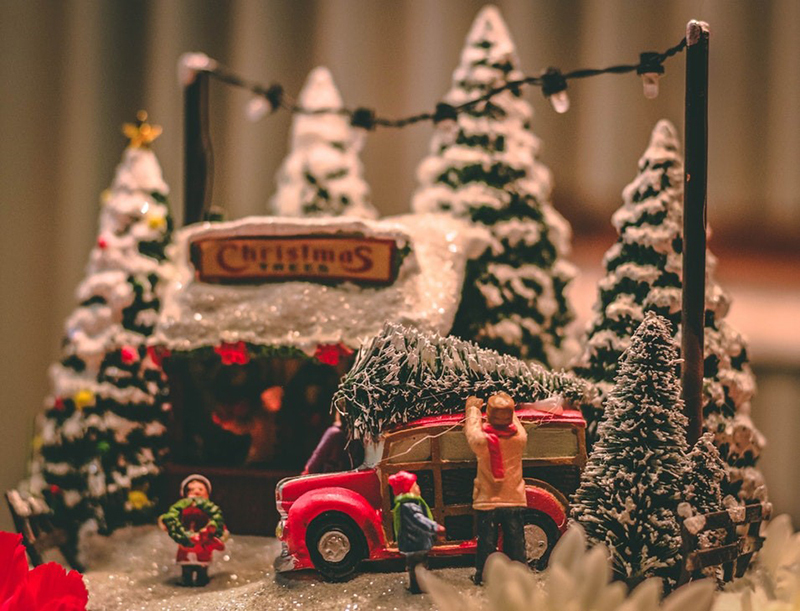 Presents haven’t always been the only thing to find under the tree, and if you’re hoping to bring a little vintage Christmas to your home this year, transport your living room back to a bygone era with a miniature landscape. Often known as a putz, these were popular in the early 1900s and 1920s, when they would typically depict scenes from the Bible or a Christmas village and would fit snugly under the tree branches. That’s not the only vintage Christmas idea you can adopt this year. Another popular tradition of the early to mid 20th Century was to have a toy train set circling underneath the tree, which dazzled children for hours. The Lionel Corporation produced these toy locomotives, which reaches their most popular in the 1950s. If you’re looking for some vintage Christmas decorations for your tree, look back over the years to see how you can evoke a little nostalgia in your home. Harken back to the Victorian era when glass garlands first became popular, when they were draped around the tree to catch the light. A cheaper alternative was to make garlands from papier mache, or to hang lametta (a precursor to tinsel) from tree branches instead. Hanging lametta from your tree in front of a roaring fire will inevitably bring some magical vintage sparkle to your home. 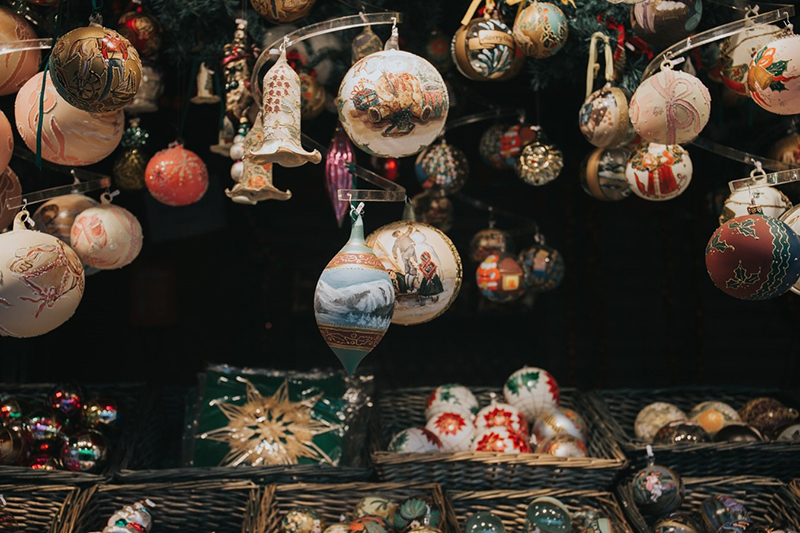 You could also invest in some glass baubles or figurals, which first hung off branches in the early 20th Century and were used to reflect the candlelight on Christmas trees in the early 1900s. These were still going strong in the 1950s, when they came in bright colours to match the sparkly aluminum Christmas trees that were at the time in fashion. Investing in brightly saturated glass and synthetic baubles would bring a retro air to your home this festive season. Authentic, home made decorations such as stringed popcorn, paper chains or cut out snowflakes brought the family together in the 1920s, while spray on snow became fashionable in the fifties. Such vintage Christmas decorations can easily be brought into the home even today. Wooden ornaments were also popular, so keep a lookout for any mini vintage Christmas santas, rocking horses or toy wooden soldiers for your tree this year. While Christmas tree lights have been around for many years, candles were once used to light up the tree instead. For a touch of vintage Christmas, invest in an antique or wooden Christmas candelabra to recall the days gone by. If you have a passion for antiques, don’t forget to dress them this Christmas. A vintage wooden ladder looks fantastic when dressed with Christmas lights, while a renaissance style wrought iron jardiniere would look truly festive when filled with glistening baubles. Take tips from your ancestors and dress your antique fireplace mantel with Victorian inspired red-dressed wreaths. Dress doorways and archways in a similar fashion, by adorning them with artificial poinsettia flowers and green garlands. Christmas stockings have to be one of the most well-loved festive traditions, and nowadays they’re often seen as purely decorative. In the early 20th Century, stockings would contain fruit and candy canes, and perhaps a small wooden toy. 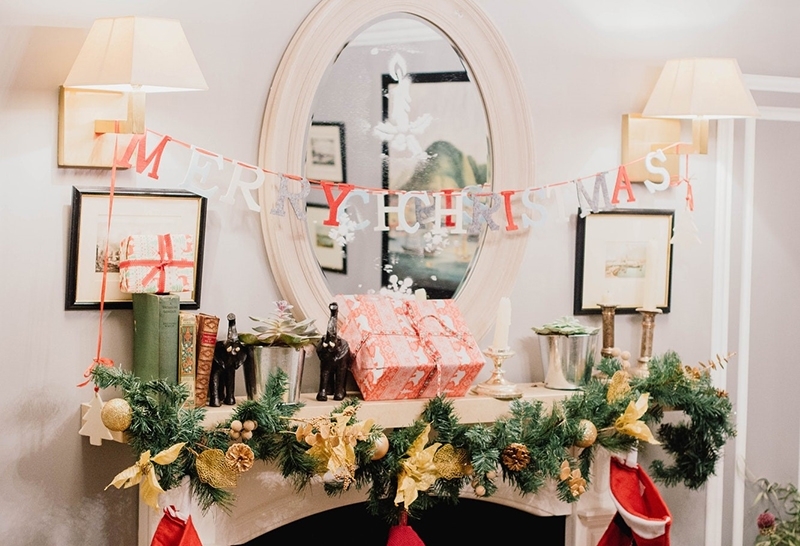 The image of stockings hanging over the fireplace will give your living room a vintage Christmas feel, although quite often they were hung at the end of the bed instead, as fireplaces were typically needed to provide warmth, heat and light. Christmas Eve traditions have ranged from retelling ghost stories to singing carols both inside and out. If you have a box of old books in your attic, why not dig them out? A vintage copy of ‘A Christmas Carol’ will delight every child the night before Christmas and will evoke memories for its adult readers, too. If films are more popular in your household, the classic ‘It’s A Wonderful Life’ is still very much loved, but will nevertheless bring a vintage Christmas feel to your home this December. With the long nights drawing in we’re more likely to be spending time in the comfort of our own homes. While it may be dark outside, antique lighting can bring you all the illumination you need this winter. Lighting is a key element in the home, whether for practical purposes or to help create the perfect mood. 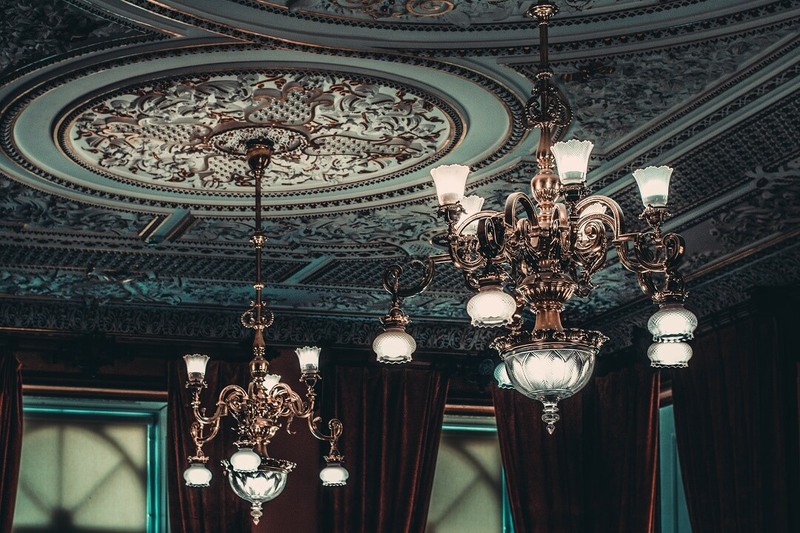 It can be purely decorative or entirely sensible, ornate or simple, big or small; whatever your tastes and requirements, antique lighting can offer answers to many problems as well as add real character to your home. Before you begin looking for antique lighting, try and work out the natural light in your home. Identify spaces that need illuminating, or whether there’s a particular area that could do with a helping hand. Whether it’s a statement fitting or a practical purchase you’re after, we’ve put together some antique lighting ideas to help you find the perfect piece. Antique lighting can really set the tone of a room and often, when selected carefully, can be its central focus. Dramatic or statement lighting will not only illuminate your home this winter, but may really command the attention of anyone that enters it. Chandeliers create a real sense of drama and there are plenty of antique chandeliers to choose from. Over the winter months and festive period we may find ourselves welcoming more people into our homes, and dining rooms can become the chief gathering place for family and friends. 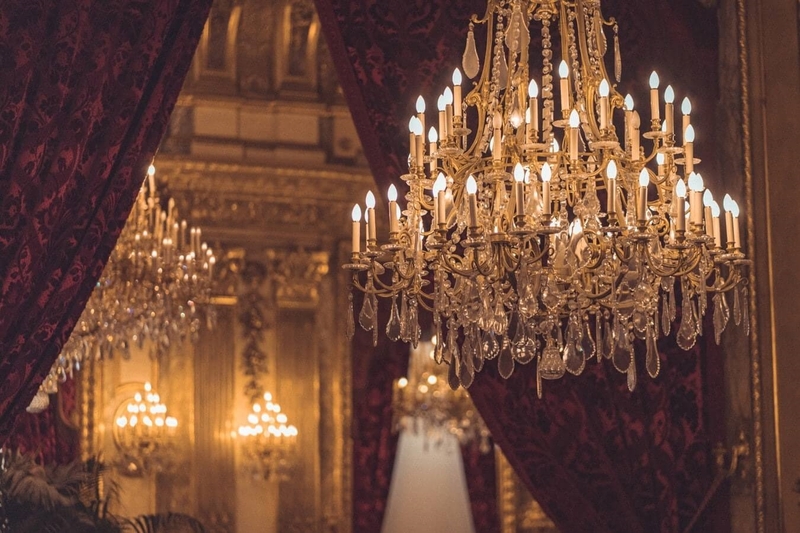 An exquisite 19th Century gilt bronze chandelier over a dining room table will bring a sense of opulence to your winter dinner parties and create a real warmth. When considering the scale of antique lighting and the size of your chandelier, it’s important to consider factors such as the size of your room and table and the height of your ceiling. Hang the chandelier so that the bottom of it is roughly around 70cm from the table. You want the chandelier to be the main focal point, but it needs to feel in balance with the rest of the room. Neoclassical crystal chandeliers set against a statement dark wall or hanging in a hallway can create an impressive impact as soon as you enter the home, while the warm glow from the antique lighting will ensure guests feel invited. If you’ve time to plan ahead, organising the rest of a room around a special piece of antique lighting can help you create the hue and warmth you’ve got your heart set on. For something completely different, a 1950s pendant light will transport you back to a glamorous time gone by. While antique lighting can be used as the cosmetic jewellery of our home, it can also be used to illuminate areas of the home that require a little helping hand, be that in the kitchen, bathroom or over a desk. When buying antique lighting, don’t forget the purpose of a room; while you may be drawn in by the beauty and splendour of a one-off piece, we sometimes need to think practically about where and how we will use it. In the kitchen, consider using pendant lighting or glass bell-shaped ceiling lights to hang over work surfaces or kitchen islands. Not only will these help you illuminate your kitchen to make cooking easier, but they’ll also create a light and airy feel, which will be welcome in the dark winter months. Juxtaposing sleek lines with more ornate items remains on trend and is one of our top fireplace ideas for this winter. Alternatively for a more stylish statement piece, opting for art deco chrome and glass ceiling lights can create a real impact. If you often find yourself working well into the evening, some task antique lighting in the study or living room will ensure you don’t strain your eyes, and the more concentrated hue from a desk or standing lamp can create a real cosy ambience to your home. Classic antique brass or restored Victorian oil lamps are subtle but effective features and can provide a pool of light in an otherwise dark room. Whether you have a nook to fill, a hallway to illuminate or a piece of art to highlight, antique lighting can help you create the right glow using wall fittings and sconces. For something subtle, Victorian or Edwardian brass candle sconces can help complement a roaring fire when used to illuminate either side of a chimney breast. If you’re hoping for something with more impact, don’t be afraid to go big. Gothic revival multi-light wall fittings will light up a room as well as make a statement. If you prefer antique lighting a little more ornate, opting for wall lights in Rococo or Neoclassical style will create an atmospheric home this winter. You may have a modern living space, but that doesn’t mean you can’t install a bit of history amidst your contemporary interiors. A staple piece of antique lighting can really add character and a unique charm to your home, which is particularly important in the winter months when we spend more time indoors. Be adventurous and don’t be afraid to mix the old with the new, clash colours or cross decades. 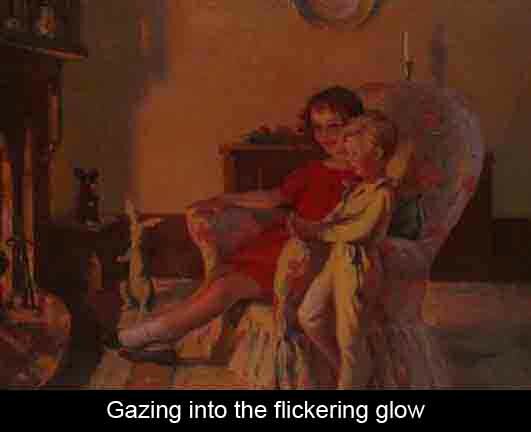 Antique fireplaces can add a real sense of warmth and light to your home and the glow from a roaring fire can complement your antique lighting. Ornate or grand feature mirrors can optimise natural light, while placing wall lights next to them will create elegant additional illumination. 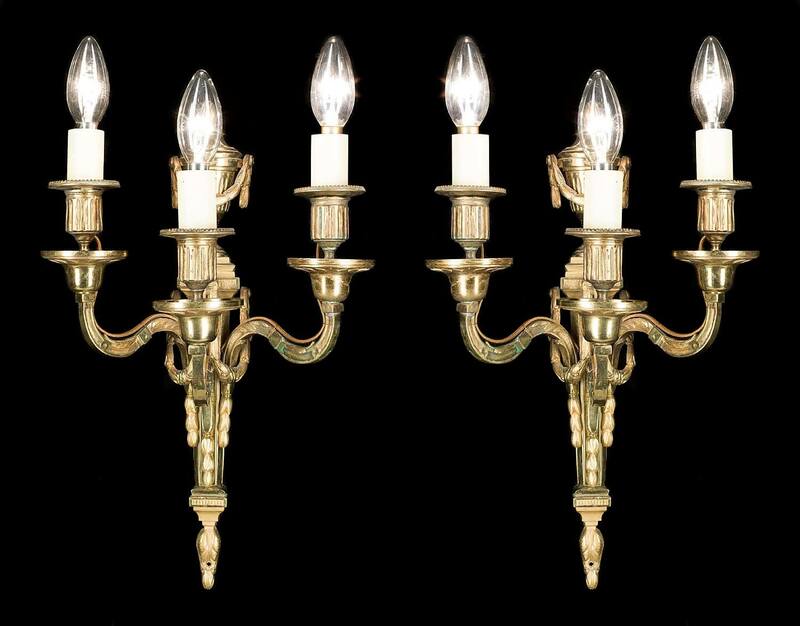 Another alternative to electrical antique lighting is to invest in some antique candelabras. Lighting your home using candlelight will create a seductively warm atmosphere and will have you feeling only too happy to stay indoors this winter. A Rococo style gilt bronze candelabra wouldn’t look out of place on a lavishly dressed dining table, while a Victorian gothic revival piece would be fitting next to any antique fireplace during these cold dark months. There are so many options for illuminating your home this winter. Browse or stock for ideas and inspiration to create the perfect festive glow. With the weather finally turning colder, there’s no better place to spend those long, dark nights than wrapped up in your own home. 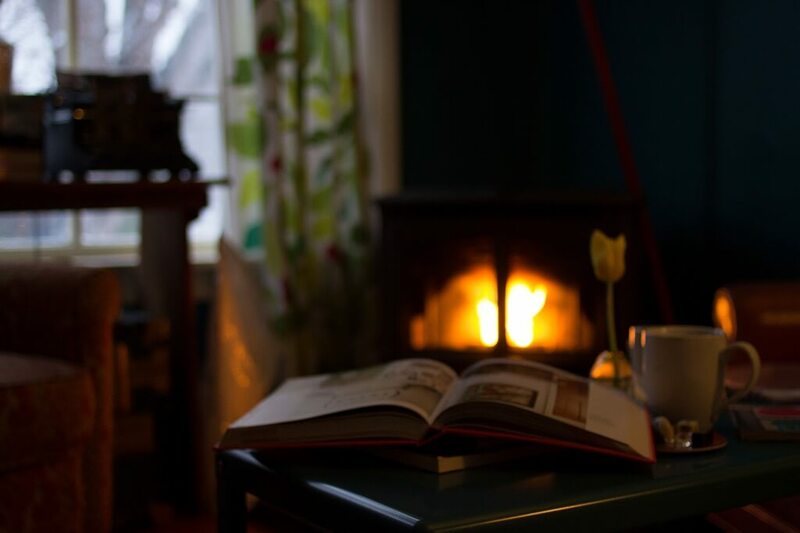 Whether you’ve got a real working fire or are thinking about buying an antique fireplace to add something special to your favourite room, there are lots of things you can do to keep cosy this winter. We’ve put together our top fireplace ideas to help you get started. The changing seasons inspire lots of us to give our homes a bit of a refresh. But instead of picking up a paintbrush why not make a statement this season? If you want to transform your house for winter, installing an antique fireplace could be the perfect place to start. For the most dramatic effect, choose a fireplace that contrasts with your existing colour palette, such as a cast iron, Georgian fireplace on a plain cream wall. If you’re already ahead of the game when it comes to winter interior design and have painted your walls grey - this season’s hue of choice - opting for a cream, marble fireplace will really make a statement. An antique fireplace looks stunning on its own but there’s plenty you can do to get even more out of it this winter. One of the simplest fireplace ideas is to use the mantel and hearth as a space to display favourite items from around your home – whether it be prints, candles or even a large mirror. As you’re preparing for the change of seasons, why not decorate the fireplace with pumpkins before making way for a festive display? Mini Christmas trees, wreaths and winter garlands all look great and add a real holiday feeling to the room. Of course, it goes without saying that you need to take extra precautions about any type of decoration if you’ve got a real working fire. Just because you’ve got a new build doesn’t mean you can’t fill your home with classic antiques. 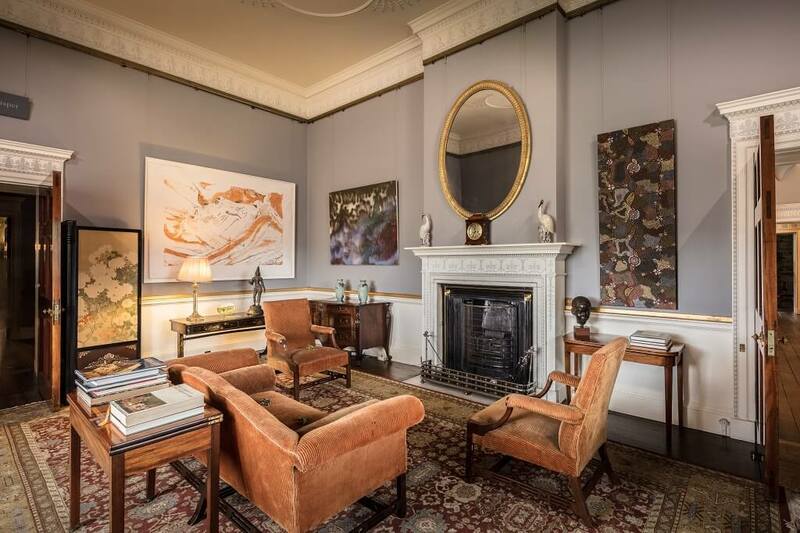 A fireplace from the 18th century won’t necessarily look out of place in a minimalist living room, while an art deco piece can still work beautifully in a Georgian house. Even if your fireplace is just for decoration, the accessories you choose to go alongside it can certainly add a sense of warmth to your home. A pretty log basket or wooden box full of kindling can add a real rustic feel, while another great winter interior design idea is to add a vase of seasonal flowers such as white roses or red poinsettia on either side of the sill. If you’re looking for a laid back vibe, there are plenty of fireplace ideas to make the room feel slightly less formal, such as choosing candles in different shapes or sizes and ensuring the decoration on each side of the hearth is slightly different rather than totally symmetrical. 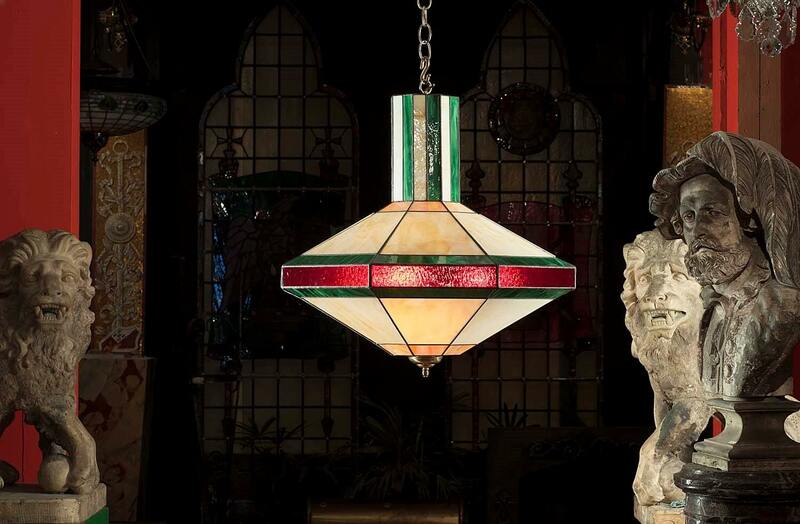 If antiques are your thing then why not treat yourself to a unique, one-off piece this winter? Fireplaces are full of history and there are so many styles to choose from – whether you go for something in the Italian Renaissance style, an English Gothic piece or a Regency antique. The oldest fireplace held by Westland dates back to the 15th century, so there really should be something for everyone! If you already count yourself as a bit of an antique collector, find a fireplace that fits in with some of the items you’ve already got, and don’t forget you can add accessories like screens, tongs and baskets to boost your collection. An ornate fireplace on a plain wall can make a real statement, but if you’ve opted for a simpler design then highlighting the space above it is one of our best fireplace ideas. A large, vintage mirror above the fireplace is one popular option, or you could hang a stylish clock or your favourite painting. Just make sure you get the balance right – if the item is too small it will get lost by the fireplace, too big and it will become the main focal point. It might take a few goes to get it right, but the final outcome will look great. Whether you have a real fire or not, lighting up the fireplace will ensure it remains the focal point of your room, especially on those dark winter nights. One of the most popular fireplace ideas is to decorate the space around it with plenty of candles or festive fairy lights - but for something a bit more permanent, a concealed strip light is also a popular option. Installing spotlights under the sill can also help your home feel warm this winter, or you could opt for a stylish pendant light on the wall above the fireplace to highlight its full potential. While you might be thinking about which fireplace will fit best with your walls, your floors are just as important. A patterned carpet is likely to jar with an ornate fireplace, while wooden flooring alongside a pine surround might be a bit too much. If your current floor isn’t the best match but you aren’t in a position for a full overhaul, a new rug could be the answer. As well as creating a fresh colour scheme, rugs are great when it comes to keeping warm in winter and a lot less hassle than changing the entire carpet. If you’re thinking about how to keep warm this winter, there’s no denying that a roaring fire is the best option. However, even if you don’t have that luxury, there are still plenty of great fireplace ideas to help you fill that empty space and create a cosy, inviting home. Stacking logs inside the fireplace gives the room a real cosy feel and it can also be a unique new space for your favourite plants. You could also try something a little different, including filling it with books, stacking it with trunks/boxes or even installing small shelves and using it to display photographs or other seasonal knick knacks. It might seem like summer has just ended but now is the perfect time to start preparing for winter and thinking about the changes you want to make to your home. Give some of our fireplace ideas a go and we’re sure you’ll be reluctant to leave the comfort of your own house over the next few months! Searching for that one-off piece for your home usually involves a day spent trawling through a flea market or vintage fair – and there’s nothing quite like finding a bargain you know will be a perfect fit. But sometimes you just don’t want to leave the comfort of your sofa, especially during those cold winter months, so why not try shopping for antiques online? With a wealth of items at your fingertips, there are definitely some great deals to be had – but there are a few things to bear in mind before you get going. 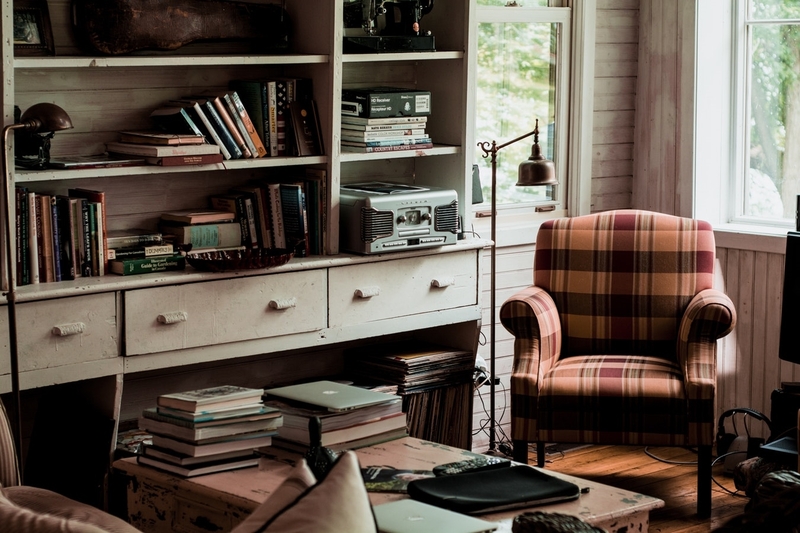 Here are our top tips to help you start shopping for antiques online. Shopping for antiques online makes it easier to check whether you are getting your money’s worth. When you find that piece you really like, it’s important to do your research before you buy by looking for similar items on other websites and checking past auction results to see what previous pieces have sold for. Obviously, factors such as the condition and size of the piece will make a significant impact on price so make sure you are comparing like for like, but there will often be enough information out there to help you make an informed decision. One top tip when shopping for antiques online is that in some cases the exact same item will be listed by its owner on various websites – and as seller fees can differ, there’s a real chance of getting it cheaper elsewhere. It’s not only important to find out as much as you can about the item you are thinking of buying – you need to make sure you are handing over your money to a reputable seller. Often you will be able to view their previous sales and look at reviews from their past customers. Websites will often include testimonials or examples of where their items have been featured which should also give you a helpful insight. If you’re still unsure, asking the seller questions about the piece should give you a good indication of how much they know and whether you feel confident enough to buy from them. By shopping for antiques online, you’ve got the opportunity to view and purchase pieces from across the globe – most of which you would otherwise never have seen. However, before you get too excited, don’t forget to factor in the delivery costs before you agree to the sale. Often items from overseas will cost hundreds of pounds to ship, especially if it’s a large piece of furniture, so make sure you can afford the extra expense. If you visited a market you would try and negotiate a price, so why not do the same when you’re shopping for antiques online? If you’re using eBay for example, it’s perfectly fine to contact the seller direct before making an offer. A polite message asking whether they are willing to accept any lower and suggesting a new price has worked for many customers, so it’s definitely worth a try, even if the listing doesn’t include a ‘make an offer’ tag. Don’t forget to keep a note of your favourite sellers and sites – if there’s something you’ve seen but can’t quite afford then it’s worth checking back frequently in case the price changes or they add more stock that’s geared towards your price bracket. It’s all too easy to forget where you’ve looked and bookmarking can save you hours of time which you would otherwise have spent trawling through your search history. Having said that, don't just stick to a select few sites as it’s certainly worth keeping an open mind and seeing as much of what’s on offer as you can. Buying at auction – even online – can often be a tense affair, so you need to be extra careful you don’t get things wrong. Prior to the auction starting, make sure you read everything about the item in question, including details of its condition and its dimensions so you know whether it will fit into your home. Look closely at the photographs included and remember you can contact the auction house for more images if you need to. However excited you are, it’s also worth waiting before jumping in with the first bid – if no-one accepts the auctioneer's first offer it will most likely go down, meaning you can pick up a better bargain. It’s likely that when you start shopping for antiques online, you will see lots of pieces you like but aren’t quite sure about because you can’t view and touch them in the same way you would in person. If there is something niggling away at you, make sure you contact the seller directly to ask your questions. Sites like eBay make it simple for you to contact the seller direct and online shops usually have their details in a prominent place on their website so you can get in touch. Sellers will often have more information about the piece that they haven’t included online and you should ask the same questions you would face-to-face, such as the age and origin, whether there are any manufacturers’ marks, and if it has been restored. Search terms play an important role when shopping for antiques online so it’s definitely something to keep in mind. As sellers may not have listed their item correctly, it’s often sensible to begin by searching broadly e.g ‘antique fireplaces’. 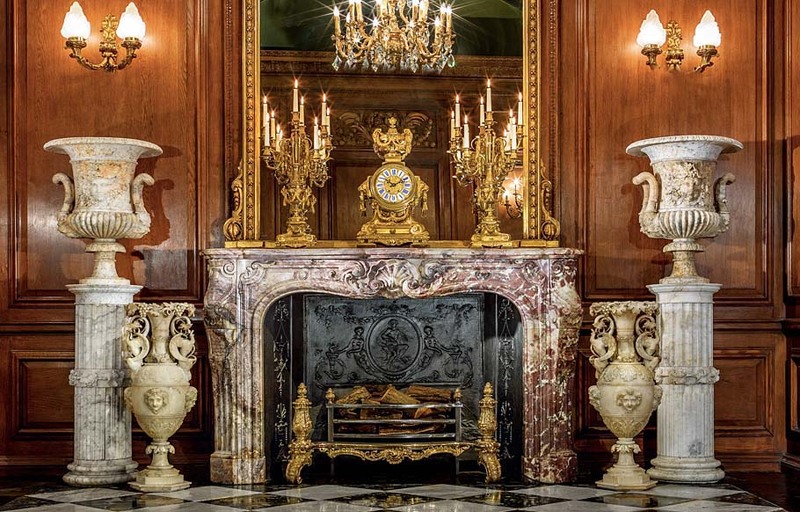 This should give you a good starting point to do some general research, see the websites that are out there and then help you refine what you are looking for, such as ‘marble antique fireplaces’. This should limit your search results – making it easier to find exactly what you want – as well as bringing up new sites that weren’t in your original trawl. Shopping for antiques online is a great way to find that one-off treasure for your home and by asking the right questions, choosing a trusted seller and doing your research, we’re sure you’ll grab a bargain in no time at all. Buying antique furniture is a wonderful way to inject some energy into your home. Westland London stocks exceptional antique furniture and has experts on site to help you pick an item you will love for many years to come. But if you are shopping for a new piece in a flea market, online or at another store, then you need to know how to spot an antique gem. If you’re buying antique furniture, you will want to know how the piece is held together. You should be looking for signs of quality craftsmanship. Open any drawers and check the sides for dovetail joints. If you can't see any then that suggests the piece is held together by the modern technique of nails and glue. If you can see dovetailing, that suggests the piece may be handmade. However, if the joints look too perfect then the piece may be machine-made. Slight irregularities in the fittings are a promising sign. Make sure the frame is rigid and solidly made. For example, if a chair wobbles, the joints may need to be re-glued or repaired. Unfortunately, time and poor care can lead to an antique being damaged. You should thoroughly inspect your piece before handing over your cash. Firstly, check your antique has everything it should. Are there any drawers missing? Is there a gap which should have something in it? Your next task is going over your product carefully. Different types of furniture wear down in different places. For example, heavier items may have been dragged rather than lifted through the years. They may also have been standing in damp conditions, which can cause the legs and feet to rot. This could cause strain or damage to the furniture, so get down and check the feet and underside of the piece. Check for signs of woodworm. If you see areas with small holes dotted around the piece, this is likely to be a sign of woodworm. Make sure that the item is treated before you take it in to your home, as it can spread to your other furniture! Ideally, when you’re buying antique furniture, you’re looking for a completely original piece. That means no modern add-ons. It could be that an old bolt has been replaced with a newer one or a new drawer has been installed. Have the handles been replaced? Check carefully to see whether every piece is an original antique. Throughout your inspection of the item, you should be checking for a label, stamp or signature. If you're lucky enough to spot one you may be able to find out who made the piece. You may also be able to delve a little more into its history. Information such as who, how, where and when can all be revealed with a good signature. Check everywhere but particularly on the back and underside of drawers, behind the piece and the lower edges. You may find something but labels and signatures can also be faked. Look out for a similar level of wear on the label, and feel the paper to see if there is any age to it. Stamps and labels start to appear more widely on furniture from the 19th century, so don’t expect them on earlier pieces. So if you believe the antique you are inspecting is older, you should bear that in mind. 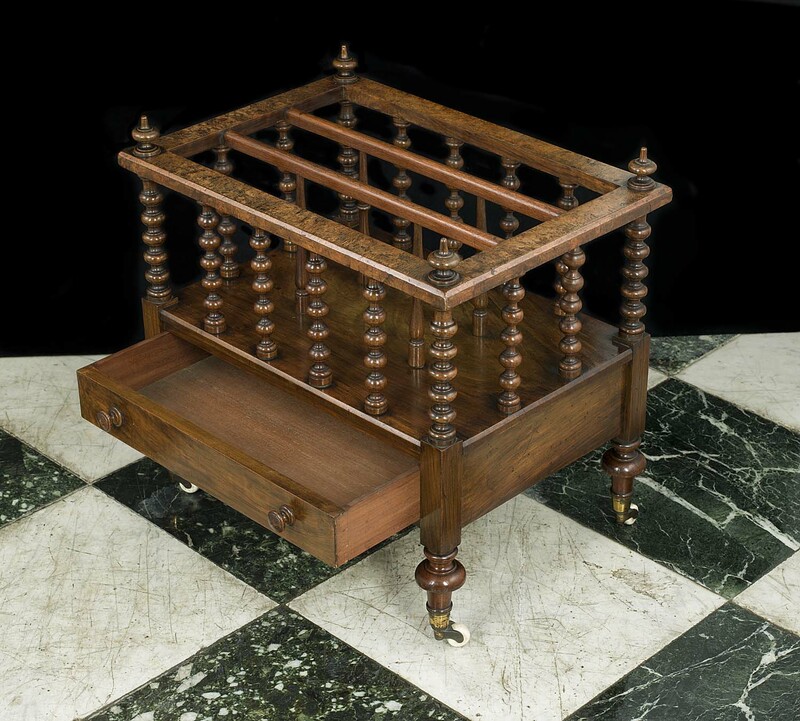 The demand for antique furniture has seen plenty of fakes appear on the market - and sometimes they can look a lot like the real thing! To be sure you’re buying genuine antique furniture and not a knock-off, you will need to get your magnifying glass out and do some real detective work. Inspect the piece for wear and tear. If there's a little bit here and there, that could suggest an older piece. You should also look for dirt in the corners of drawers which, again, indicate age. A store such as Westland London gives you the chance to physically view your item at our Shoreditch showroom before making a purchase. But more and more antique pieces are appearing online. It is still possible to pick up a genuine item you will love but you should be more careful. Buying from a large name in the antique world is far safer than buying from an unknown dealer. You should take time to connect with the sales staff, asking lots of questions to put your mind at ease. The dealers may be members of BADA or LAPADA, which means that they have been deemed both a knowledgeable and trustworthy company. Ask for lots of photographs, the more candid the better. It is always better to have too many photos rather than too few. This will give you a clear idea of exactly what faults/damage there may be. If you think you've found a product you love, search for customer ratings and comments about the store. If most customers seem happy with the service and product they received, you probably will be as well. Ask to see the piece. If you live close enough to where the product is stored, you could ask to see it. There's no harm in asking and it could put your mind at rest. The saying ‘out with the old, in with the new’ has taken a back seat recently; vintage is all the rage and antiques are seeing a rise in popularity. Antiques are often thought of as statement pieces that belong in the house. 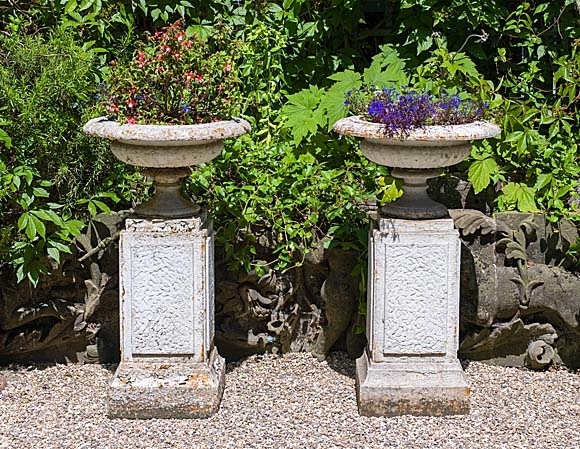 However, antiques don’t just belong in the house, there’s a wonderful array of beautiful pieces for the garden too which is why it is time to learn how to use architectural antiques in your garden. Your antiques deserve to see the light of day! Bring them outside to add uniqueness and elegance to your garden. Take your garden from drab to fab with our expert tips on how to use architectural antiques in your garden. Antiques can add a whimsical feel to any garden. An antique cast iron drinking fountain can become a bird bath. A wrought iron gate can become home to a flowering trumpet vine. Your antiques stand out just by being themselves, but making them feel like they sprouted from the ground and called your garden home is the key to giving your space an enchanted feel. The more the merrier and antiques are no exception. When considering how to use architectural antiques in your garden, think outside the box. Turn your garden into a showroom of curiosities by mixing and matching pieces for maximum effect. Don’t stick to one time period, material or size. Pick materials that encourage each other, pieces from eras that contrast and materials that embolden each other. 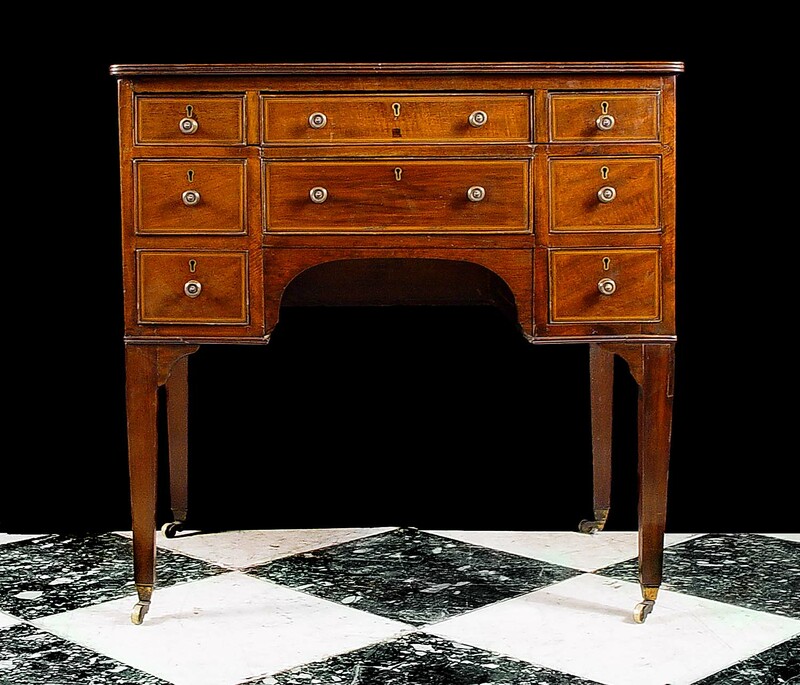 By carefully contrasting individual antiques you’ll begin to see them in a whole new light. Just because you are decorating your garden, it doesn’t mean you have to stick to traditional garden antiques. Be daring and add an ornate mirror to a brick wall or use an antique log bin as a flower pot. These unexpected accents will add a touch of eccentricity that is sure to draw the eye. 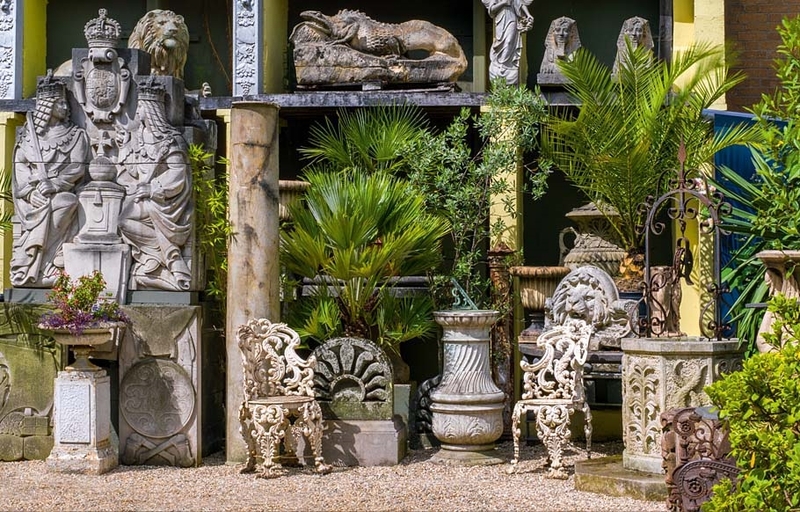 Although we’re telling you how to use architectural antiques in your garden, we also know there’s a lot to be said for modern decorations as well. However, you don’t have to limit yourself to one or the other! Playing the two styles against each other adds dimension to the garden. Pair a modern outdoor table with Victorian wrought iron garden chairs to create a tasteful contrast between the past and present that will be the star of afternoon tea. A fun and whimsical garden is the goal, but don’t underestimate order and symmetry. The eye likes things that flow together and make sense. The positioning of your antiques needs to look carefree, when in reality you spent time planning the equal space between all your urns. 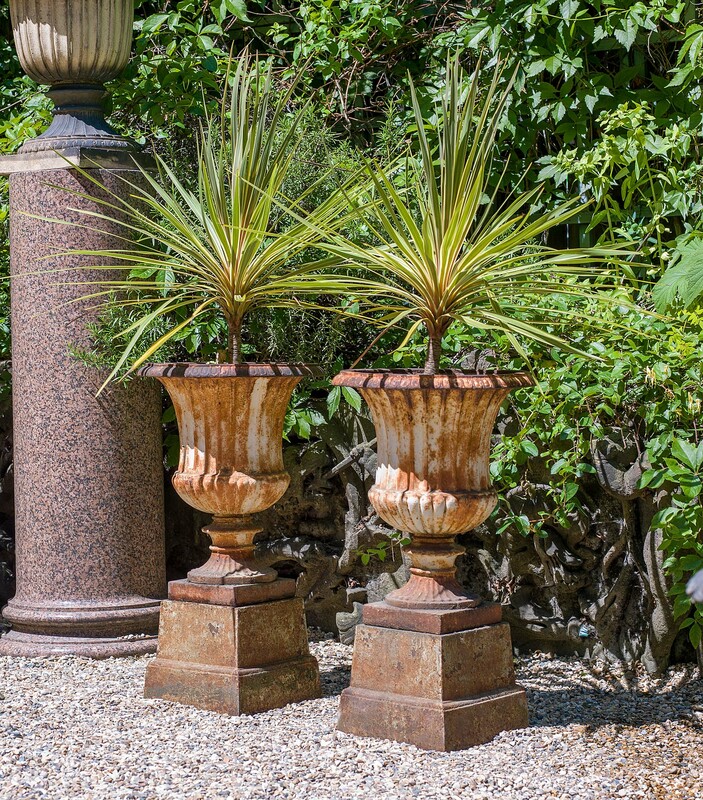 Your antiques should highlight the best parts of your garden. Placement plays a large part in accenting a garden. 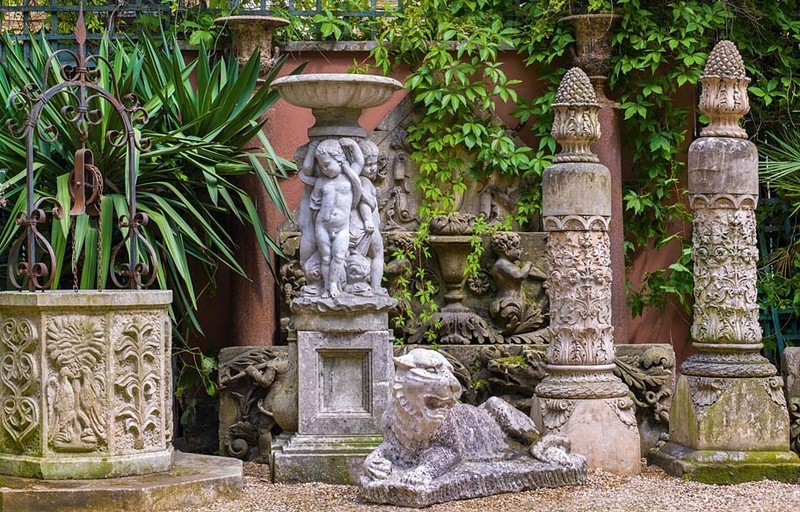 Using architectural antiques to frame a particularly unique or beautiful scene can ensure an enchanting atmosphere in your garden. What's the point of creating an ethereal garden if it feels too stuffy? 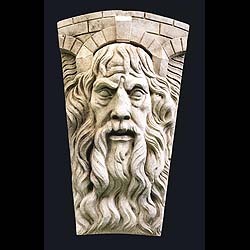 It is important to know how to use architectural antiques in your garden to create a peaceful and friendly environment. A sofa canapé or an old church pew can create a secluded spot that is perfect for curling up on with a good book and a cup of tea. Equally, you could create an outdoor aquarium with a 20th century fountain - fill it with koi fish and water plants and spend your afternoon feeding the fish. Adding fabrics, colours and patterns to your architectural antiques will help add character to the space you are trying to create. Plant bright, vibrant flowers around a baroque-style fountain to make the stone prominent. Reupholster an antique chair with a more modern pattern to keep it from blending in. Make your antiques an extension of your personality. Lighting is an important factor in the placement of your antiques. Take a day to figure out how the lighting works in your garden. Is it shady most of the time? Is there one spot that always has a ray of sun shining down? Utilise light to make the piece the centre of attention; place your wrought iron chairs and table in the sunniest part so it’s in a natural spotlight or put a jardiniere under your porch light so even at night it can shine. Watch out you don’t make a royal error and put your prized sundial in the shade! Of course a garden is only as good as the flowers it holds. Use colourful, bold flowers like begonias or peonies to accentuate the dark colour of a pair of cast iron urns or highlight the simple design on a light-coloured stone urn. Knowing how to use architectural antiques in your garden can turn your concrete patio into a lush oasis. Emphasise your antiques. Create one or two seating areas surrounded by stone urns filled with greenery and tables with little pots and flowers. To soften the patio’s stonework, place a series of cast iron gates along the garden wall so flowering vines like wisteria can grow. Not gifted with green fingers? No problem! Having a garden can be stressful if you’ve not got a gift with greenery, but we’ve got a handy solution to your gardening woes. Succulents and cacti are the perfect alternative to flowers. These hardy plants come in all shapes, sizes, textures and colours, meaning your garden can still be a feast for the eyes without having to remember to water daily! What’s more, the soft shades of green look wonderful against the earth tones of architectural garden antiques. 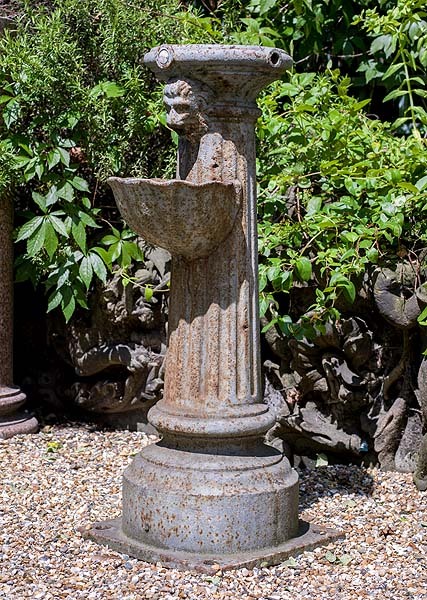 Knowing how to use architectural antiques in your garden and bringing a bit of the past to your present is a great way to keep things fresh and unique. From flowers to design to decoration, your garden should be full of life and create an atmosphere that you can enjoy and be proud of. Use these tips on how to use architectural antiques in your garden to create the outdoor oasis of your dreams. We surveyed 2,000 people in the UK to find out how much they know about our famous monuments and landmarks. And, well, it’s shamefully rather little! 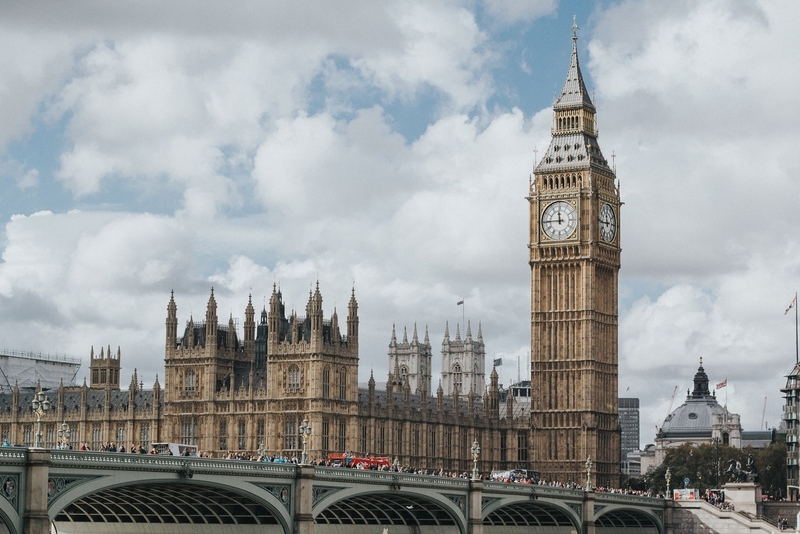 Overall, Brits scored just 44.5% on the test to identify historical monuments and landmarks! Fancy taking our interactive quiz and seeing if you can beat the national average? Antique fairs are a great way to get started on any antique journey. Whether it’s your first time or your fiftieth, there is always something to surprise or delight in the sprawling maze of stalls and stands at antique fairs in the UK. We’re incredibly lucky to have so many antique fairs in the UK, many of which are internationally renowned for the quality of their merchandise. Antique fairs are where professional buyers rub shoulders with thrifty students and creative homemakers all looking for a hidden gem. As with most things in life, the more time you put into antiquing the better your return. But with some fairs finishing before lunchtime and others only moments from central London, you don’t have to give up a whole weekend to get the very best antique buying experience. 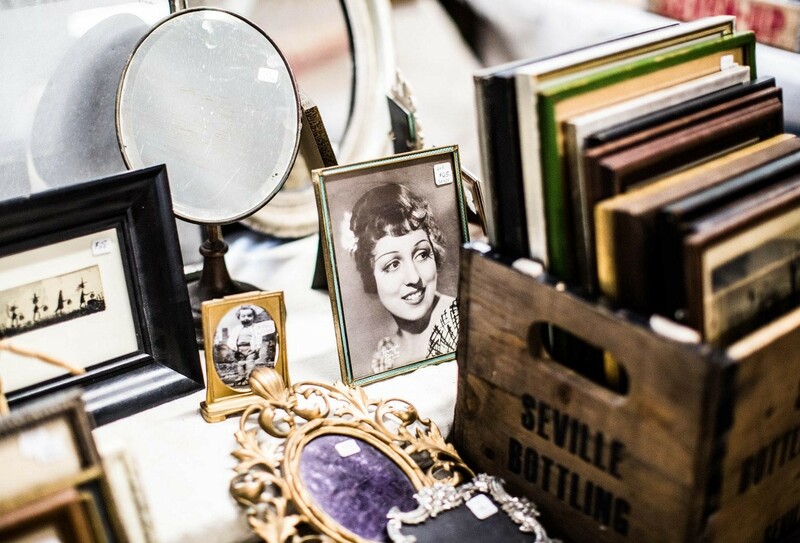 If you’re looking to redecorate a room, find a great gift or even just for a fun day out with friends and family, we hope you find the perfect event in our guide to the best antique fairs in the UK. Location: Lindley Hall, The Royal Horticultural Halls, London. 2019 Dates: 20th January, 24th February, 17th March, 28th April, 26th May, 16th June, 7th July, 8th September, 13th October, 10th November, 1st December. Best for: A family affair. Despite the fact the fair is held on a monthly basis, queues are still fairly common, so it’s certainly worth getting to the venue before the doors open. Each event features around 140 stalls of quality antiques, combined with the stunning backdrop and central location it’s no surprise the fair has been a firm favourite since the 1970s. Traders and buyers flock to the fair from across Europe and each event offers a real mix of items. TOP TIP: It’s worth checking the website to see if anything special is on offer on the date you plan to visit. 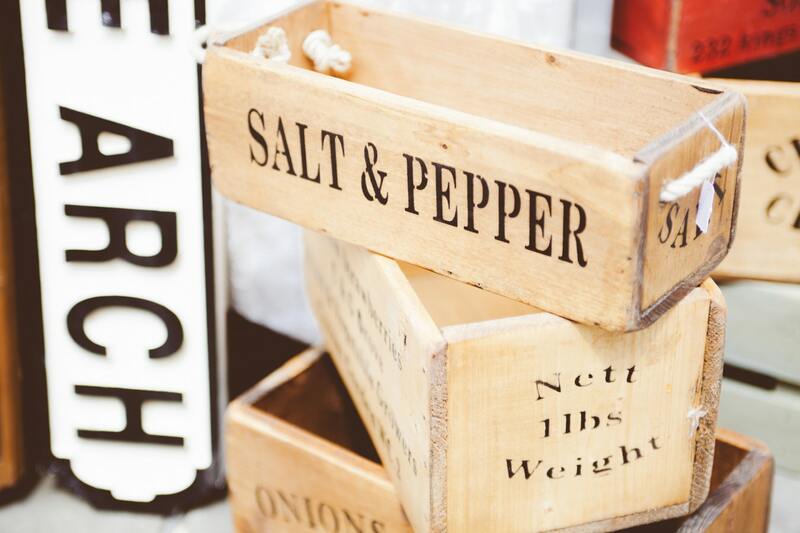 Despite having a loyal following, it remains one of the most welcoming antique fairs in the UK and enjoys a fairly relaxed atmosphere, so it’s definitely one to visit for a more leisurely browse. 2019 Dates: 4th - 7th April, 18th - 21st July, 28th November - 1st December. While it might not be the most spectacular of locations, Art & Antiques for Everyone has become the largest fair outside of London and the vast space means you get to see an awful lot without having to trek to other venues around the country. 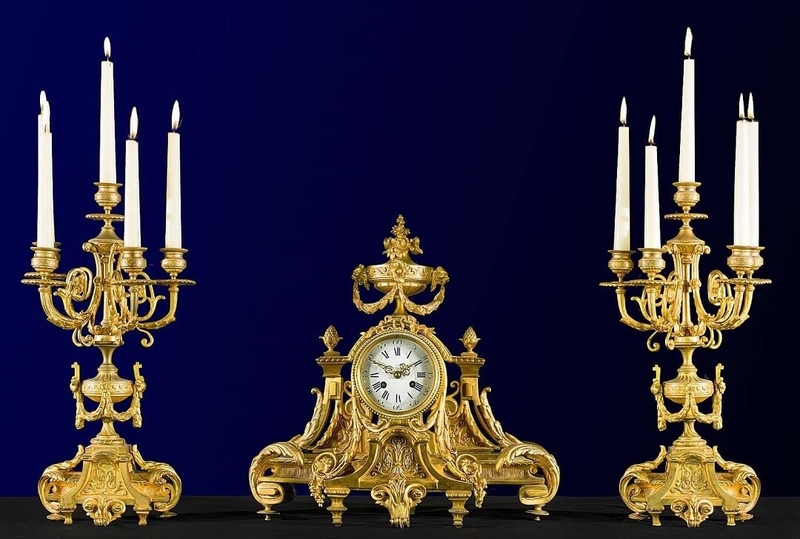 An eclectic range of objects from antiquity to the present day will be on show at the events this year, including unique art deco pieces and continental furniture. One of the best attended antique fairs in the UK, it also includes talks from a number of guests including Antiques Roadshow experts, so it might be worth taking a seat before you head to the stalls to bag that bargain. Boasting perhaps the most stunning backdrop of all antique fairs in the UK, Antiques in the Park is also one of the largest in the country with a huge and eclectic mix of collectables and vintage items from all eras ready to be discovered. 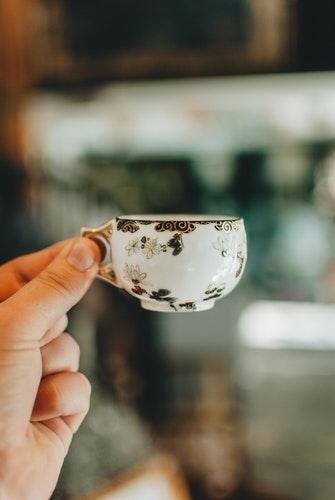 The event – which sprawls over the national trust grounds – has a real feel-good factor thanks to its licensed bar and live music and is a perfect place to pick out a hidden treasure or find some home décor inspiration while soaking up the unique atmosphere. Best for: Getting a regular antique fix! Bargain hunters and seasoned collectors alike can get their antique fix throughout the whole year thanks to Arthur Swallow Fairs. Its flagship event, the Lincolnshire Antiques and Home Show, was established more than ten years ago. Now, it’s not only one of the largest antique fairs in the UK, but across Europe, with exhibitors setting out their wares across the 200-acre site on a bi-monthly basis. Although particularly popular with interior designers, architects and collectors, the fair is also a big hit with ordinary homeowners who want to create a unique space. 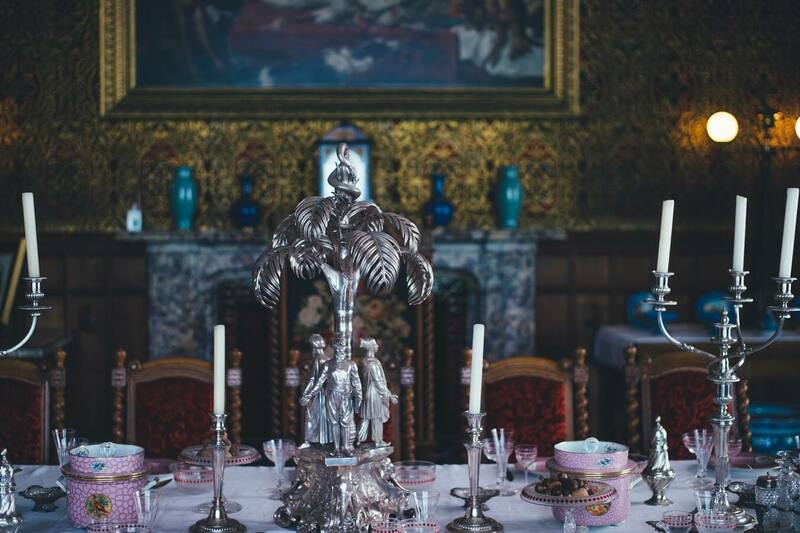 Throughout the summer, the company hosts its popular Decorative Home and Salvage Show at Ripley Castle, Loseley Park, Cheshire Showground and new for 2019, Welland. The salvage shows are a must visit for anyone in the midst of a renovation project with upcycled furniture, period fixtures and fittings and industrial-style items all available to browse and buy. Throughout the year, Arthur Swallow have also added a number of dates to their popular Vintage Flea Market which will be held on 20th January, 17th February, 10th March, 28th April, 15th September, 27th October and 17th November. The vintage fair is perfect for those looking for a more relaxed day out while on the hunt for those quirky trinkets and retro pieces. 2019 Dates: 20th -24th March. Best for: Quality at good prices. Usually a highlight of any antique lover’s social calendar, the Chelsea Antiques Fair was much missed last year. 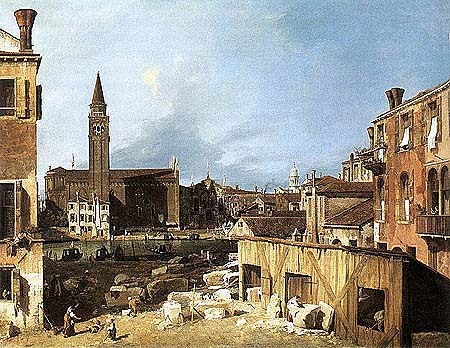 While the Old Town Hall was being refurbished, the Chelsea Fair - which usually runs alongside the BADA festival -took a year off. 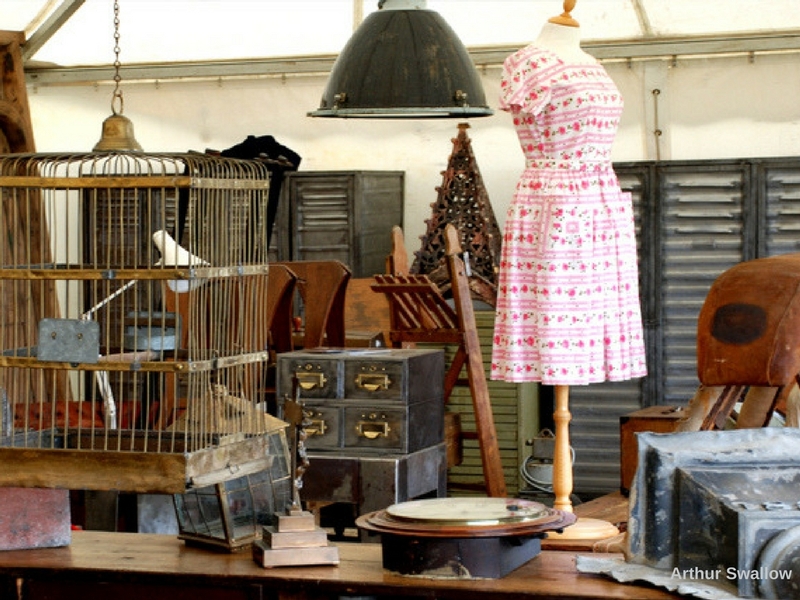 Established in 1950, it is one of the most intimate and prestigious antique fairs in the UK. With a capacity for only 30 stands inside the Town Hall, the emphasis is on quality over quantity. Expect knowledgeable dealers and unique pieces. 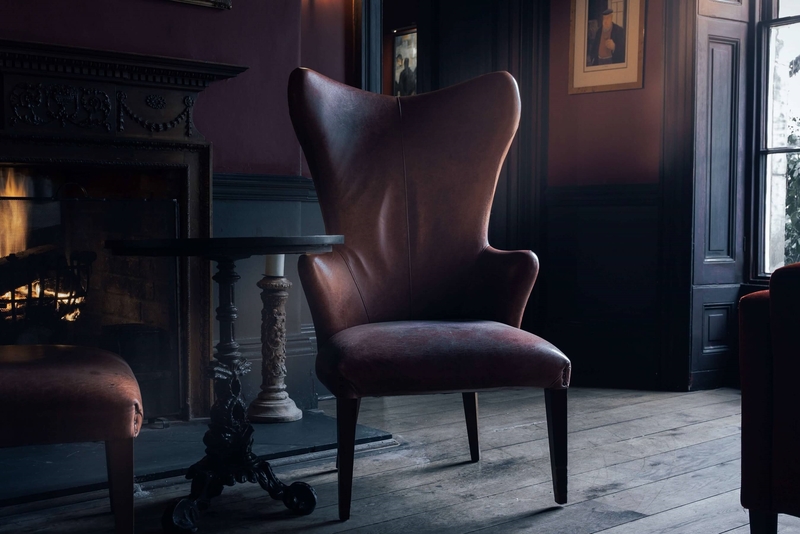 Chelsea has become known for its influence on budding dealers aiming to blaze their way in the world of antiques. Dealers such as Robert Young, Wakelin & Linfield and Witney Antiques all started out at Chelsea. As one of the most reasonably priced of the major London fairs, it’s a great chance to discover a hidden treasure. It’ll certainly be worth the wait to see the Old Town Hall restored to its former glory and everyone bringing their best after the year off. Location: The Royal Highland Centre, Edinburgh. 2019 Dates: 23rd - 24th February, 11th - 12th May, 31st August - 1st September, 23rd - 24th November. Scotland’s largest antiques event boasts up to 300 dealers bringing a real mix of good quality retro homeware, clothing and art for all tastes. To cater for the unpredictable Scottish weather, the fair is held entirely indoors – which also makes it a great way to spend a wet and windy weekend. Getting there couldn’t be easier, with coaches going from the city centre straight to the venue – visit the fair’s website for more details. Location: Firle Park, near Lewes. 2019 Dates: 9th - 11th August. More of a mini festival than a simple antiques fair, Firle is a great trip out for all the family and the perfect way to spend a summer weekend in the Sussex countryside. As well as more than 100 stalls featuring unique pieces from the past, the fair is a celebration of times gone by. Other displays include beekeeping and wild food workshops, a spectacular catwalk and live entertainment from dance troupes. Over 200 vintage car owners will showcase their motors to visitors and the vast selection of artisan food and drink stalls will help fuel the day’s activities. 2019 Dates: 26th - 27th January, 23rd - 24th March, 25th - 26th May, 13th - 14th July, 5th - 6th October, 30th November - 1st December. Best for: Local history and agricultural antiques. Renowned for its selection of agricultural antiques, the Great Antiques & Vintage Fair at Wetherby Racecourse blends seamlessly into its local surroundings. The vendors, as well as their goods, take influence from the region and keep the heritage of the North East alive. Rather than traditional antiques, the fair offers a great selection of memorabilia and vintage. However, the affordability and community spirit of this event makes it one of our top antique fairs in the UK. 2019 Dates: 17th February, 19th May, 1st September, 1st December. Best for: beginners and vintage enthusiasts. Since opening in 1873, Alexandra Palace has played host to countless spectacular events. 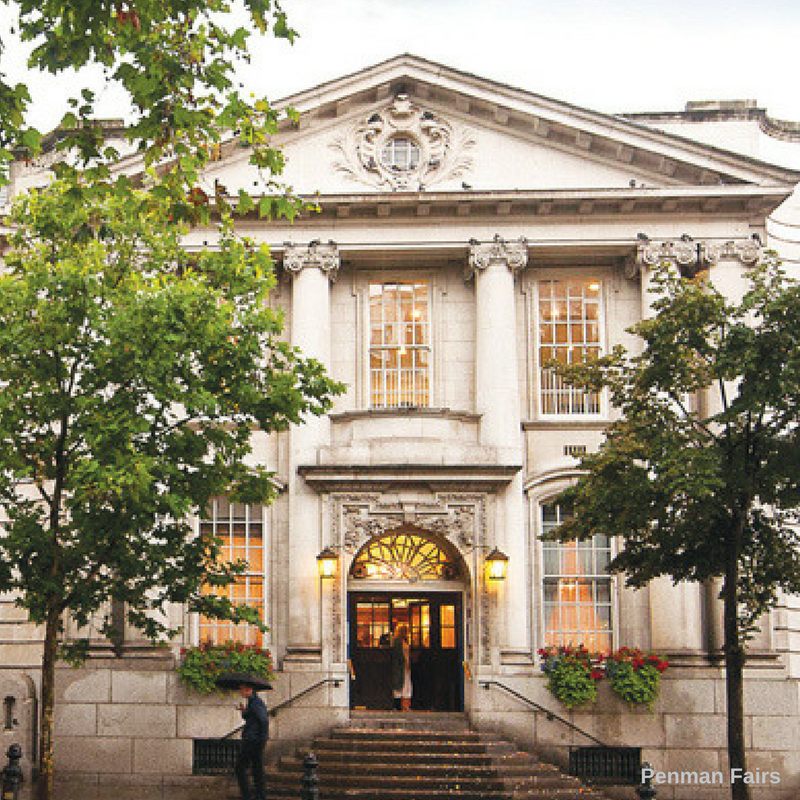 As well as becoming a hub for arts and culture, the Palace proudly houses the IACF Antiques & Collectors Fair. The Alexandra Palace Fair is the largest in London and one of the best attended antique fairs in the UK, regularly attracting over 300 dealers. The quality and scale of the fair sees it frequented by public and trade buyers alike. Traditionally known for its vast selection of 20th-century and Art Deco stalls it’s the perfect place to hunt for glassware and early plastics. Thanks to it’s easily recognisable style, browsing the Art Deco selection is a wonderful way for beginners to get into antiquing. With a vast array of clocks, tea services and much more there’s a treasure to be found around every corner. 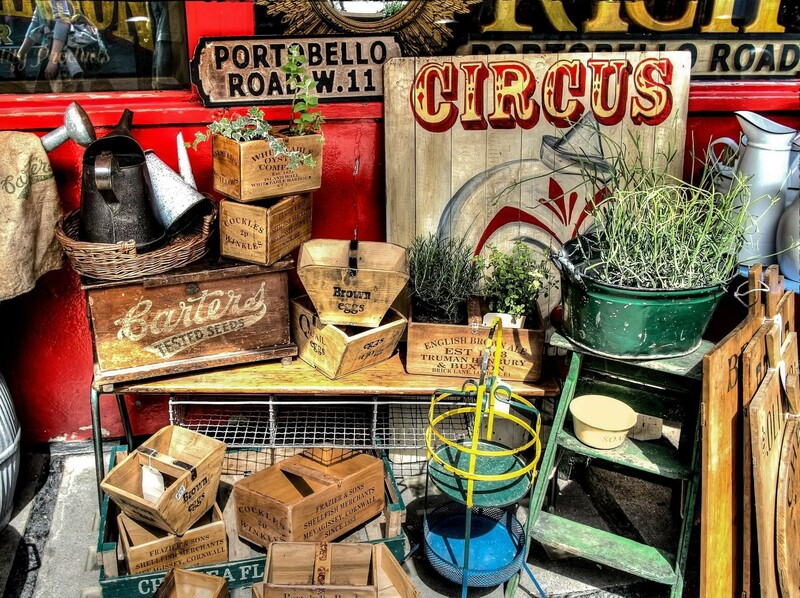 A welcome addition to the Antiques & Collectors Fair is the Pop Up Vintage Fairs London who bring a fun twist to a traditional antiquing experience. Their stalls comprise of vendors from all over the UK and Europe selling the best vintage merchandise in London from designer clothing for men and women to retro furniture and mid-century homeware. 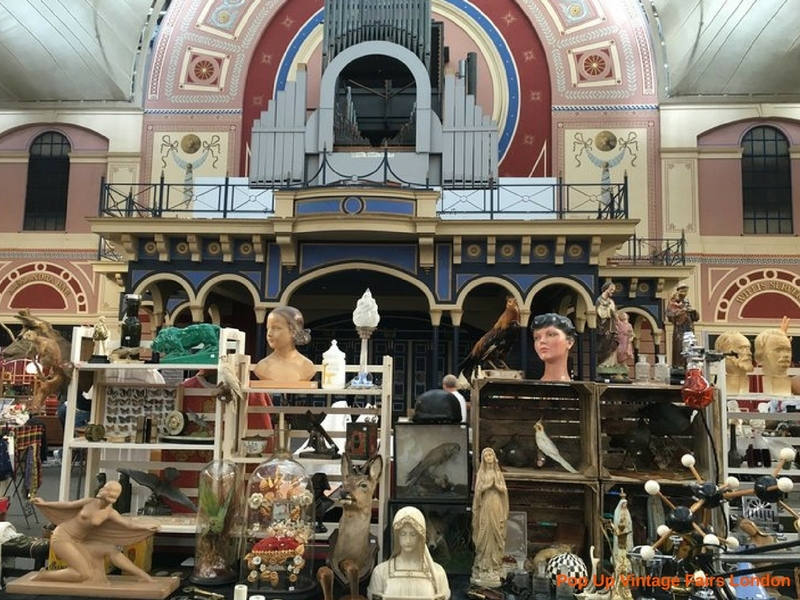 Easily accessible by public transport and car, the Alexandra Palace Antiques & Collectors Fair is a must for anyone looking to get into antiquing. Before you book your tickets, be sure to read our beginner’s guide to buying antiques - here. This popular fair promises a treasure trove of vintage pieces and furniture and could be the ideal place to grab a bargain for your home, with lamps, signage and collectables all on offer as well as more one-off collectables. A real vintage theme runs across the weekend and the fair’s hosts will be hoping for the sun to shine on the outdoor event to encourage a repeat of previous record crowds. The ticket also includes admission to the wonderful park and gardens and the popular dinosaur trail, so why not make a day of it and bring all the family along as well? 2019 Dates:13th - 18th September. Almost ten years since it launched, the LAPADA fair has become one of the most prestigious antique fairs in the UK. This year over 110 exhibitors bringing everything from tapestries to ceramics will flock to one of the capital’s most iconic locations. As you would expect with a fair hosted by LAPADA – the largest society of professional art and antique dealers in the UK – the event will be stocked with some highly sought after pieces and packed with seasoned collectors. It also promises treasures for first-time buyers and those with smaller budgets, so it’s certainly worth an after-work trip out to Mayfair. 2019 Dates: 3rd April, 29th May, 10th - 11th August, 9th October, 4th December. Best for: Collectors, interior designers and retail buyers. The Lincolnshire Antiques & Home Show is an excellently curated fair which brings together the very best in antique dealership. It is considered by many to be one of the best antique fairs in the UK for set and interior designers. Its well-organised stalls and collection of fine antique furniture make it a great destination for anyone seeking interior inspiration. The fair also offers a wide variety of antiquities at reasonable prices; the buildings of the showground host dealers selling jewellery, vintage trinkets and smaller collectables. Although the fair is a veritable playground for the experienced buyer, it’s also a great place to get creative and see how you could integrate antiques into your home. 2019 Dates: 3rd March, 23rd June, 3rd November. Best for: Antiquing with a view. Unlike the popular Malvern Flea, the Malvern Antiques & Collectors Fair takes a purer approach to antique buying. Usually held inside with up to 150 exhibitors, in June, the fair spreads out into the grounds of The Severn Hall. The Antique & Collectors Fair is a great opportunity to look for high-quality antique, retro and vintage merchandise all in one manageable fair. Not only is Malvern one of our favourite antique fairs for its variety and quality, the stunning view of the Malvern Hills is the perfect backdrop to a day antiquing. 2019 Dates: 20th January, 10th February, 22nd April, 27th May, 28th July, 26th August, 15th September, 13th October, 8th December. The Malvern Flea & Collectors Fair is the largest of its kind in the UK. It has a vast array of bric-a-brac and decorative collectables, jumbled together in a maze of curiosities. Although you’re unlikely to find major collectables and high-value pieces, there’s still a great selection of interesting items on offer. As well as the fascinating and diverse stands, the atmosphere at the Malvern Flea is not to be missed. Stalls of miscellania are broken up by artisans selling home-made food to fuel your antiquing. A great place to get your hands dirty sifting through house clearance boxes, furniture and everything in between. 2019 Dates: 27th June - 3rd July. 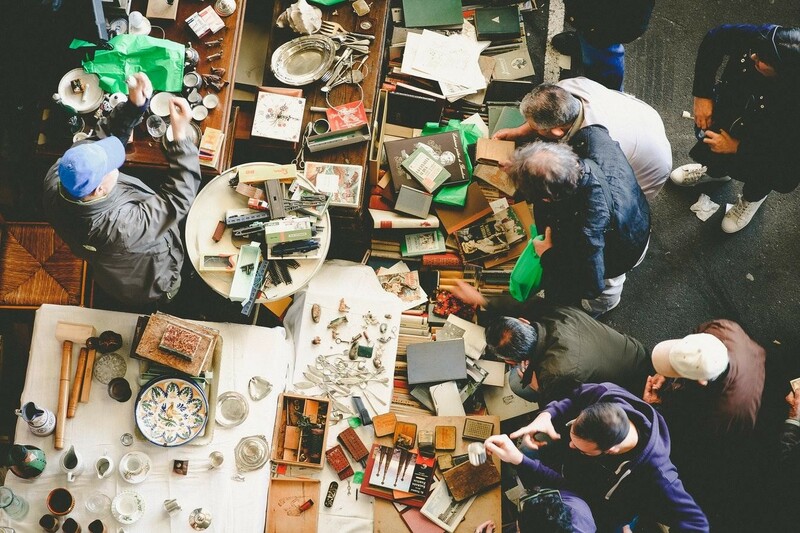 If you think you know anything about antiques, this is one fair you don’t want to miss. Priding itself on being the world’s ‘leading’ cross collecting fair, many see this event as at the heart of the antiques calendar and this year will include 160 international exhibitors showcasing their collections. But don’t be put off if you’re not an experienced collector, as the fair offers a vast selection that you won’t find at other venues across the country and not just for those with lots of money to spend. As well as the chance to get your hands on – or at least see – some of the best pieces on the market – particularly its impressive collection of British and European Art – the fair also includes a number of events, including champagne tastings, stand talks and highlight tours with academics from Sotheby’s Institute of Art. Location: The London Marriott Hotel, Grosvenor Square. 2019 Dates: Thursday 10th to Sunday 13th January. Best for: Finding a late Christmas present. The Mayfair Antiques & Fine Art Fair has become a firm favourite on the London antiques calendar since it launched seven years ago and it's easy to see why. Located in the hotel’s recently refurbished Westminster Ballroom, the fair offers a vast selection of art and antiques - including ceramics, vintage watches and an array of paintings. 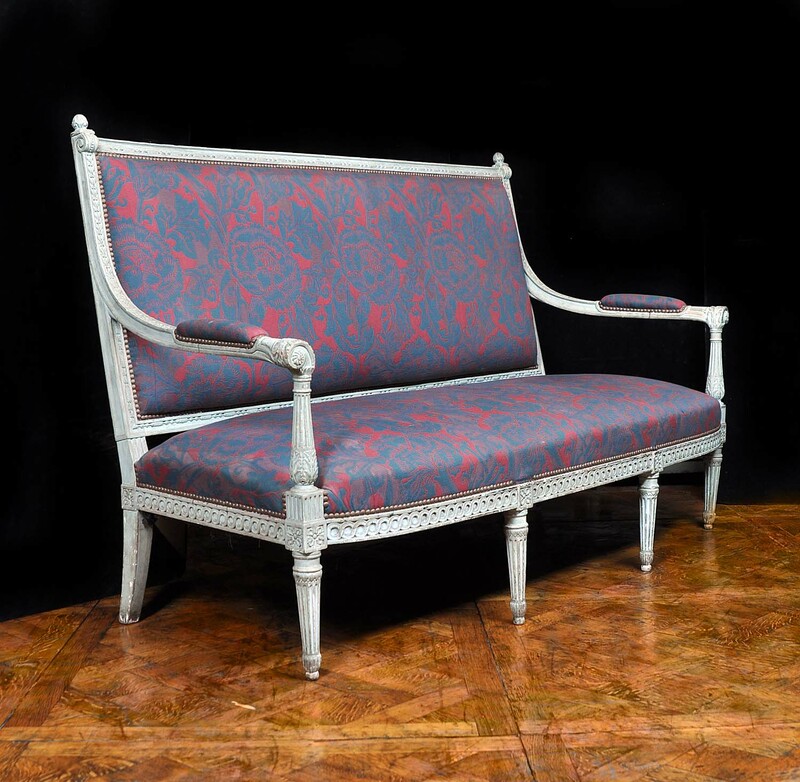 With most of the dealers being members of BADA or LAPADA, the fair promises high quality and rare pieces. Being held at the end of the festive period, this boutique event often attracts visitors not only from throughout the UK but from across the world. The fair runs from 11am to 6pm on Saturday and Sunday and, with the hotel boasting two Gordon Ramsey restaurants as well as plenty of other eateries, there's no need to leave the venue until you've found exactly what you're after. 2019 Dates: 31st January - 1st February, 4th - 5th April, 30th - 31st May, 15th - 16th August, 10th - 11th October, 5th - 6th December. As the largest event of its kind in Europe, the Newark International Antiques & Collectors Fair is known world over. Its sprawling 84-acre plot housing up to 2500 stands pulls in dealers and buyers from around the globe. The fair’s scale and spectacle have even contributed to it being featured in 1000 Places to See Before You Die ! There are a huge variety of antiques available from decorative interior pieces such as chandeliers and china collectables to architectural gardenwear and industrial lighting. Thanks to its status as a pilgrimage for antique dealers and buyers, you’re likely to find high quality merchandise and knowledgeable traders. It’s certainly one of the antique fairs in the UK not to be missed. TOP TIP: if you’re going to soak up the atmosphere and hopefully bag a bargain, tickets on the Friday are £5 instead of £20 for the Thursday ! If you want to get the whole experience, a Thursday ticket will include Friday entry too. 2019 Dates: 19th - 20th April, 27th - 28th September. Best for: A great day out. The Peterborough - Festival of Antiques is a great all-rounder if you’re new to antiques or if you’ve been antiquing for years. Although some vendors are specialists in their field, the majority sell an eclectic mix of items. If you keep your eyes open you’re likely to find a great piece at an even better price - and bartering is a must ! As one of the largest antique fairs in the UK, be prepared to rummage to find the best deals and wear your comfiest shoes ! Both in and outdoors, there’s no need to worry about the weather putting you off a great day antiquing. TOP TIP: If you’re really searching for a gem, the early spot from 7am - 10am is worth paying an extra £7.50 to beat the crowds and get the cream of the crop. 2019 Dates: 10th March, 21st April, 21st July, 25th August, 13th October, 24th November. Best for: vintage and 20th-century collectibles. If you’re looking for a fun and eclectic fair, the Shepton Giant Flea & Collectors Market is the best around. The fair offers a great selection of silver, porcelain, militaria and paintings. As well as traditional antiques there’s a vast array of collectables on offer including West German ceramics, costume jewellery, kitchenware, plastics, advertising items and crockery. If the huge variety of vintage and retro objects isn’t enough to persuade you, the fair also claims to have the best pasties in the South West! Just another reason why Shepton is one of our favourite antique markets in the UK. 2019 Dates: Every second and last Tuesday of the month. Best for: The early bird and the curious. Held bi-monthly, the Sunbury Antiques Market at Kempton Park Racecourse is great for those wishing to keep up-to-date with their antiques. Despite being one the most frequent antique fairs in the UK, it is still considered to be a hidden gem. At Kempton, antique dealers mix with collectors, interior designers and window dressers all looking for unique inspiration. The early bird catches the worm at Kempton as fairs start between 6:30-7am and close between 1-2pm, depending on the venue. Be sure to check your dates if you’re hoping to get first pickings as times can vary. This year, the popular fair will continue to run at Sandown Racecourse, Esher which will run on the following dates: 5th Feburary, 2nd April, 7th May, 2nd June, 15th September, 1st October and 3rd December. Amazingly both Kempton and Sandown offer free entrance and free parking to encourage anyone still on the fence to come and give antiquing a try. Their dedication to keeping antiques alive makes Sunbury one of our favourite antique fairs in the UK. 2019 Dates: 16th - 19th May. Best for: An intimate shopping experience. One of the more intimate fairs on the circuit, around 30 exhibitors are expected in 2019, showing everything from contemporary art to jewellery and decorative items. The fair is regarded by some as the longest continually running antiques fair in the country and its 2019 edition is one not to miss. The Vintage Home Show might be one of the smaller fairs in the UK but it has become hugely popular since launching in 2012. The iconic location draws in the crowds who come from far and wide to find retro lighting, ceramics and textiles to create the most stylish of homes. As well as interior designers, the show is also a haven for those undertaking their own home renovation projects keen to find something that little bit different and promises items to include most budgets. Travel back in time with iconic and instantly recognisable household pieces from bygone eras and if you want to find something that will transport you back to childhood, this is the place to be. These are just a few of the many antique fairs in the UK. If you’re looking for a fair near you, Antiques Atlas is a great resource for finding all the best local events. With knowledgeable vendors and an easy atmosphere, antique fairs are a great way to start collecting. Don’t be afraid to haggle. Buying antiques can be hugely rewarding. There’s nothing quite like the thrill of finding a beautiful, one-of-a-kind piece that fits in perfectly with your home - especially if it’s a bargain. Westland London has been dealing in antiques since 1969 and we well remember how daunting it can feel when you’re just starting out! It can be tricky to know whether you’re getting a good deal, but the best way to learn is to arm yourself with a bit of basic knowledge and start from there. We’ve put together a beginner’s guide to buying antiques that has many tips that you may find helpful including where to buy, how to find gems and spot fakes, and how to do it on a budget. First things first - what actually is an antique? 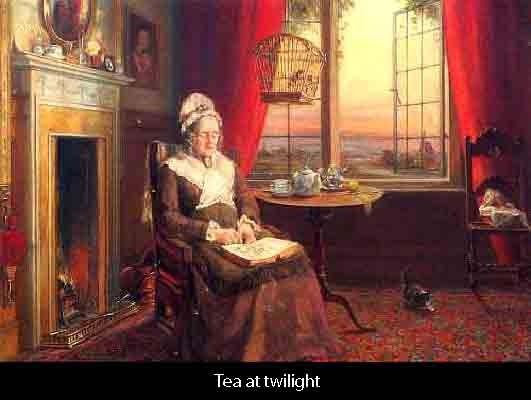 Whilst the term is used somewhat loosely, most antique dealers agree that items over 100 years old are antiques. The Oxford Dictionary definition of an antique is “a collectable object such as a piece of furniture or work of art that has a high value because of its age and quality“. Some antique experts have differing opinions on what can properly be called antique. For example, some consider only ‘masterpieces’ of design and quality to be antiques - but many people (including us) would think this is doing a lot of wonderful items a disservice. As a general rule of thumb, the 100 year rule is probably the safest way to go. But we’d encourage you to do your own research to help you decide. When buying antiques, you need to be able to distinguish between different time periods. This will help you identify bargains, suss out fakes and talk to antique dealers with confidence - as well as work out which styles will work best in your home. 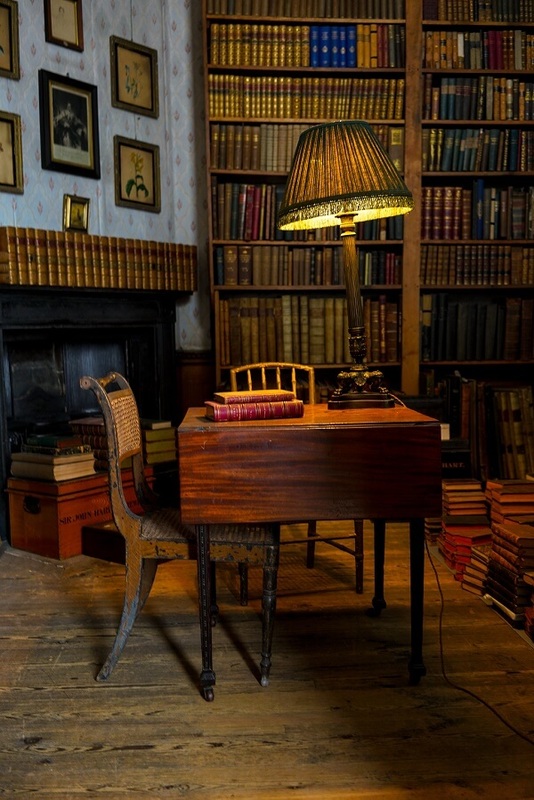 Before you begin your antiques odyssey, do a bit of research online or get a good book on the subject. 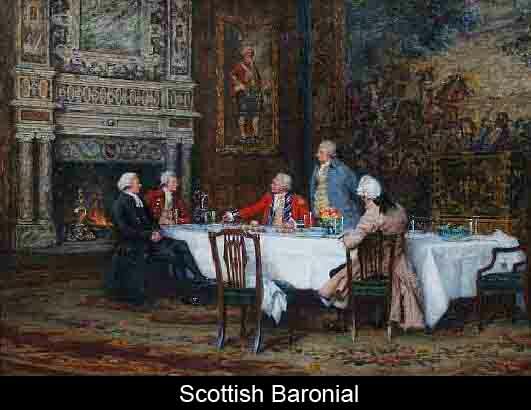 Look at pictures, drawings or photos showing examples of fireplaces, furniture or mirrors from different periods. Pay close attention to the different materials, finishes, styles and decorative motifs common to each period. For example, a Renaissance fireplace will be very different from an Art Deco fireplace. 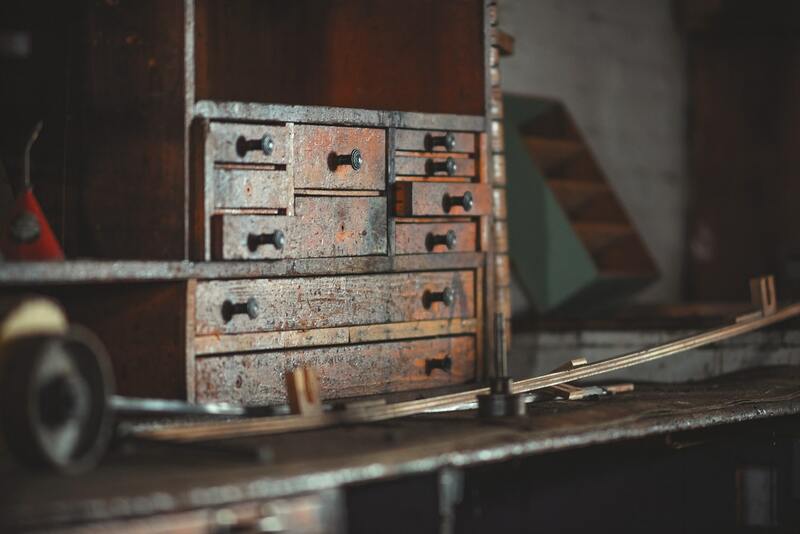 To give you a little head start, here’s a mini antique furniture buying guide explaining what to look out for to determine the age of an antique. Looking at these clues individually, as well as the piece of furniture as a whole, should help you ascertain how old it is. Examine backs, bottoms and insides - most handmade items will have irregularities in their surfaces. The bottoms and backs of items, and the insides of drawers and doors, are good places to look for these imperfections. Most machine-made pieces date from after 1860, so if the piece you’re examining is perfectly finished, it’s likely to have been made after this date. Look at upholstery fabrics and woods - different types of wood were common during different periods, and the same goes for upholstery fabrics and patterns. Familiarise yourself with them during your research, and these elements will become important clues to an item’s age. Check out matching elements - elements that are supposed to match, like drawer handles or feet, may be slightly different in shape if they were handcrafted. Again, perfectly uniform components are likely to indicate machine construction. Look for old screws - screws weren’t fully machine-made until the mid-19th Century. Screws made before this were either partially or fully handmade, meaning no two are alike. It will take time to become an expert, but equipping yourself with some basic knowledge to begin with will stand you in good stead - and the more antique shops, fairs and auctions you go to, the quicker you’ll learn! Car boot sales - car boot sales are a great place to start out buying antiques, and can be prime bargain territory. You’ll see a lot of junk, but there are gems to be found. Be prepared to turn up early, pay in cash and negotiate hard. Flea markets - as with car boot sales, you’ll probably have to do a lot of sifting, but every now and then you’ll hit on something special. Charity shops - charity shops are great for finding lower-end antiques. Donated items are often vetted first by local antique dealers, so a lot of the good stuff won’t make it to the shelves. But bargains slip through nonetheless, so it’s always worth a rummage. General dealers - antique dealers’ shops are often delightfully chaotic, making them a joy to explore. General dealers usually do house clearances, meaning they may have items they don’t know much about. Once you’ve got a bit of knowledge, this is the ideal place for buying antiques - just beware of dealers believing pieces are worth more than they are. Specialist dealers - specialist dealers’ shops are good places to find rarer or more specific items. Their pieces may seem expensive, but they’ll be valued correctly, so you’ll be getting what you pay for. If you can afford them, these pieces often turn out to be the best investments. Antique centres - antiques centres are perfect for newbies. They gather together lots of different reputable dealers, so you can be confident they know their stuff. If you show an interest, dealers are usually willing to share their knowledge, so antique centres can be great places to learn the ropes. 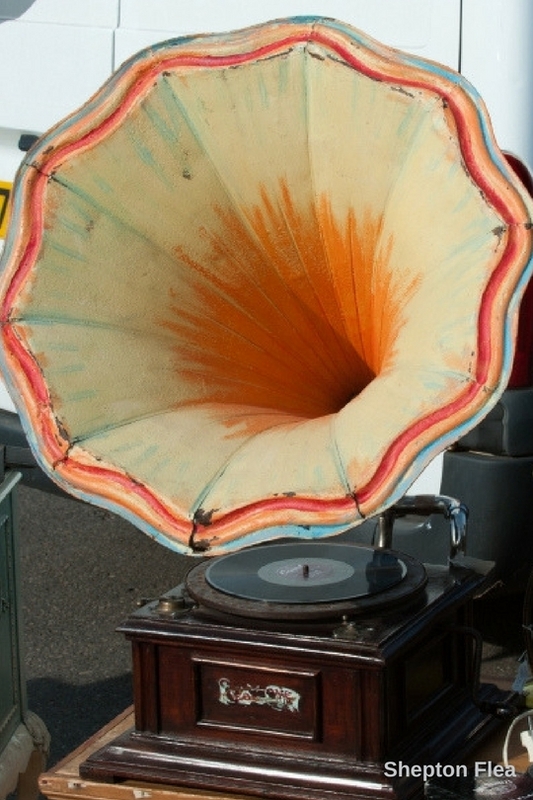 Antique fairs - there are fairs held throughout the year all over the country, some with a staggering number of dealers. Fairs like this are worth the entrance fee just for the sheer variety of items on offer and the number of serious dealers you’ll find under one roof. General auctions - general auction houses will often have sourced a lot of their haul from house clearances, so they’re good for picking up undiscovered treasures. If an item you like is unsold at the end, speak to the auctioneer - they may be willing to accept the reserve price. Specialist auctions - there’s no need to be intimidated by specialist auctions. Like specialist dealers’ shops, they’re often the safest and easiest places for buying antiques. The specialists will have correctly dated and valued the items, so you’re very unlikely to get ripped off - and this is where you’ll find some of the very best pieces. eBay - it can be a little more difficult to buy antiques from eBay as you can’t see the items in person, but there’s a huge variety available. If you’ve got a bit of knowledge and know what you’re looking for, it’s an antique buyer’s playground. We recommend trying as many different places as you can, as often as you can. Make sure the auction houses and dealers you buy from are members of BADA or LAPADA - this will ensure they’re reputable and greatly reduce your chances of getting ripped off. Are the joints well made, or have they separated? Do doors and drawers work properly? Are there any bits missing? Is the hardware complete and tight? Are there any cracks, stains, chips or broken bits? If you’re happy with the condition, or are willing to restore it, then follow your instincts because you may not get a chance to buy that piece again! It’s every antique buyer’s nightmare - taking home a fabulous period find only to realise later that it’s a fake. So, how do you spot those fraudsters? These are all evidence of post-1930s construction and are tell-tale signs that the piece is a reproduction. Look for signs of wear - but more importantly, signs of wear that make sense! The underside of a 19th Century table may have a waxy rim around the edge where people have touched it, an antique chair will likely show more signs of wear at the ends of the arms where people’s hands have rested, and a drawer that’s been opened thousands of times will show signs of wear around the runners. Check for classic authentication marks like hallmarks on silver and purity marks on antique jewellery. There are numerous sites cataloguing different antique marks and how to identify them. Wood - older furniture is often made from more than one type of wood - it didn’t make sense to use expensive wood for parts nobody would see. Reproductions tend to be made from one type of wood all over. Upholstery stuffing - synthetic stuffing materials weren’t introduced until the 1920s, so original pre-1920 upholstery will be stuffed with natural materials like horsehair. Hand carving - slight imperfections in the craftsmanship are an indication that an item was carved by a human, rather than a machine. Joints - reproductions are often joined exclusively by glue, whereas antique pieces tend to have reinforced joints like dovetail, dowel or mortise and tenon. Odour - newer pieces of furniture will smell newer, with the scent of wood still discernible. It’s difficult to describe an ‘antique’ odour, but you’ll know it when you smell it! Remember that reproductions have been around for a long time, and some reproductions are valuable antiques themselves - but only if they’re sold as such. If you think an item may be a fake, ask the seller and make sure they answer positively one way or the other. Legitimate dealers won’t object to your questions. If there’s any uncertainty in their answers, walk away. The more experienced you get, the easier it will become to recognise the fakes. The best thing you can do is learn as much as you can - handle as many genuine antiques as possible, compare them to known fakes, study reference guides and speak to other collectors and dealers. You don’t have to be rich to enjoy antiques - it’s possible to find great antique pieces to suit even the smallest budget. Be a treasure hunter - at antique shops, don’t just look at things at eye level. Hunt on top of cabinets and shelves and under tables - this is a great way to find smaller hidden gems. Get to fairs and car boot sales first thing - this might mean arriving at 6am but it will be worth it! All the best bargains will have been snapped up within a few hours. Having said that, if you can hold out long enough it’s well worth sticking around until the end of the day. Sellers may be willing to knock down their prices if items are left hanging around. So make a day of it! Be open to anything - whether it’s a teapot, compact mirror or walking stick, you can find some really unique items if you keep an open mind. Sometimes the cheapest, most unassuming trinkets turn out to be worth much more. Don’t be afraid to haggle - spend five or ten minutes building up a rapport with the seller. Ask about the piece and maybe tell them a bit about why you’re interested in it. Ask the seller what their best price is, and if it’s too much, gently probe to see if they’d be willing to accept less. Keep it friendly and hold your nerve - you never know, you might be able to negotiate a bargain. Time to start buying antiques! We hope our antique buying guide has whetted your appetite - now all that’s left to do is dive into the wonderful world of antiques. Our Shoreditch showroom is a great place to start. 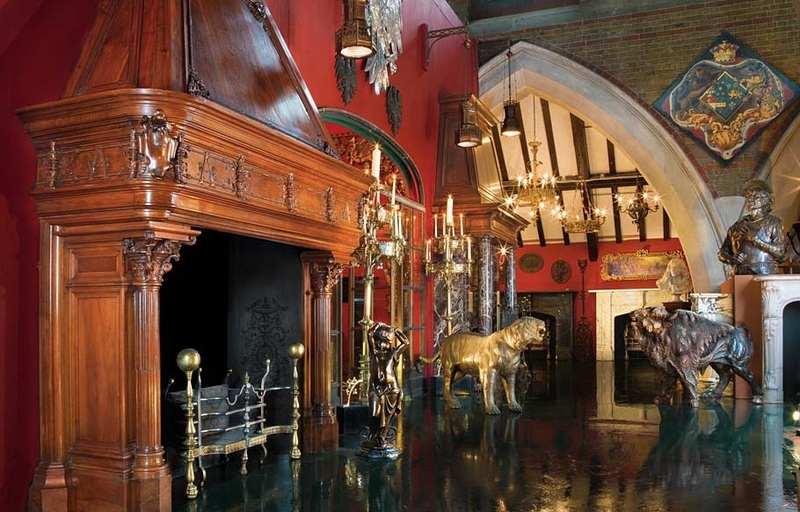 Housed in an atmospheric Grade I listed church, it’s packed with exceptional antique fireplaces, chimneypieces, chandeliers, furniture, sculptures and more, and we’re always happy to talk about our collection. Antiques can take all shapes and sizes – from paintings to pottery, coins to cutlery. Each country has its own unique traditions and history so perhaps it’s no surprise the most popular antiques vary wildly from country to country. We found that antique mirrors, sculpture, jewellery, paintings, furniture and clocks were popular across the board - but results varied massively from country to country. 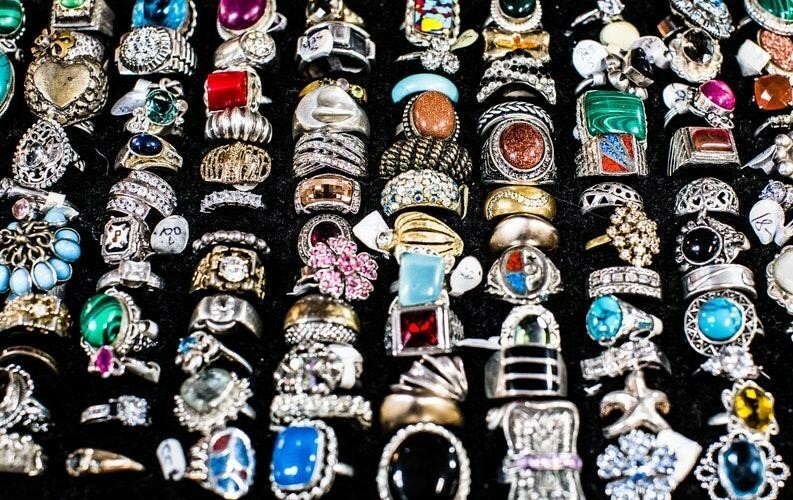 Jewellery, for example, is searched for 5.5 times more often than any other antique in India, but fails to make the top three in the USA, Russia or many European countries. In the UAE, on the other hand, mirrors dwarf any other antique searches by tenfold. 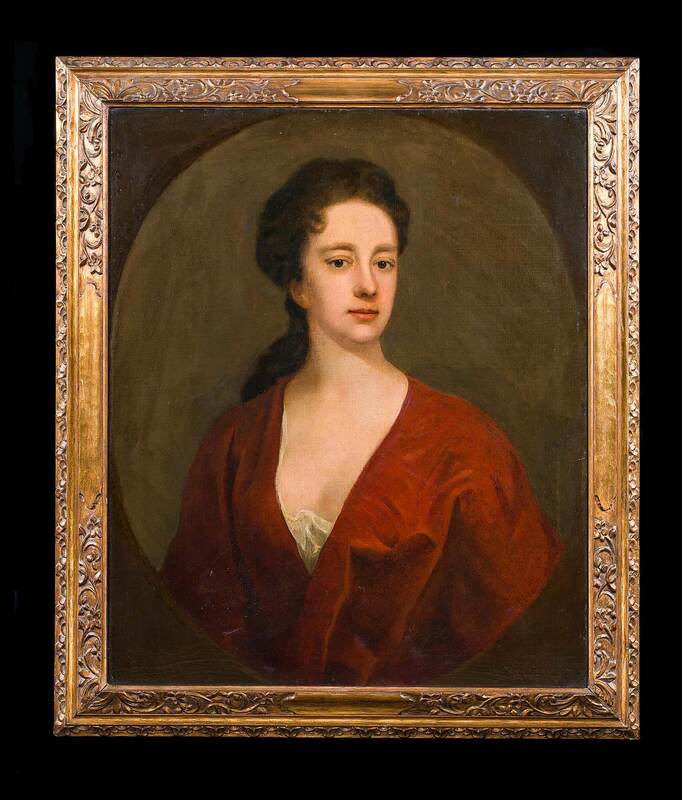 Curious to know the top three antique searches in the UK? It’s furniture, jewellery and clocks. What about antique fireplaces we hear you ask? We’ve been asking ourselves the same question! 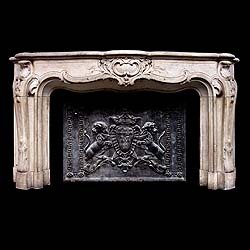 This article features one of our finest new chimneypieces (Stock No. 14516) unites exquisite quality with powerful symbolism in form of a salamander. It is an enchanting combination, telling the tale of royal iconography and revolutionary ambition. The Salamander is a creature cloaked in mystery. In the 1st century AD Pliny claimed that the Salamander “is so intensely cold as to extinguish fire by its contact, in the same way as ice does.” Later accounts by Aristotle and Leonardo da Vinci contained similarly fantastical observations, Da Vinci believing the salamander, "gets no food but from the fire, in which it constantly renews its scaly skin”. These accounts added to the mystique of the elusive amphibian, and it became valuable for its supposed medicinal and magical purposes. It was only much later that the salamander was to serve a heraldic purpose for the French Crown. King Francis I was a significant patron of the arts and champion of humanism, who encouraged Leonardo Da Vinci to come to France, and with him, the Mona Lisa, which he later acquired. His reign saw the French exploration of the New World, and with it, expansion of the French colonial empire. Francis had carefully selected the emblem of the salamander to represent him as King, with the accompanying motto, “Nutrisco et extinguo” (I nourish and I extinguish). This emblem was widely used in royal palaces, art and architecture. Far from being a keen herpetologist, Francis I was aware of the rich symbolism entwined with the mythical creature. Paired with the motto, the salamander becomes symbolic of virtue, nourishing the fires of belief and knowledge and extinguishing the flames of sin and disordered passions. The salamanderalso possessed talisman like properties due to its famed ability to withstand annihilation by flames. It was evenrumoured that Pope Alexander III had a prized garment made of salamander skin. It is now assumedthat this garment was in fact woven from asbestos mined in Tartary, something that was frequently mistaken for hair, or nest, of the salamander. Marco Polo was one of the first to voice his scepticism, identified asbestos as the source of the legend. 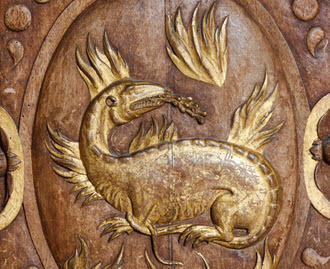 The emblem of the salamander expanded beyond the royal household and became a feature within many other grand homes in France. 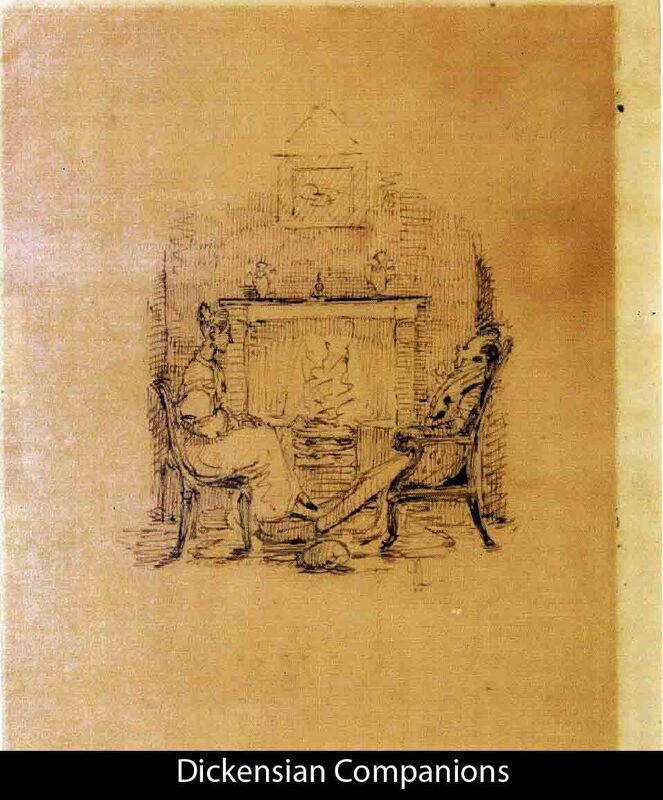 One chimneypiece in our collection bears particularly fine renderings of this insignia. 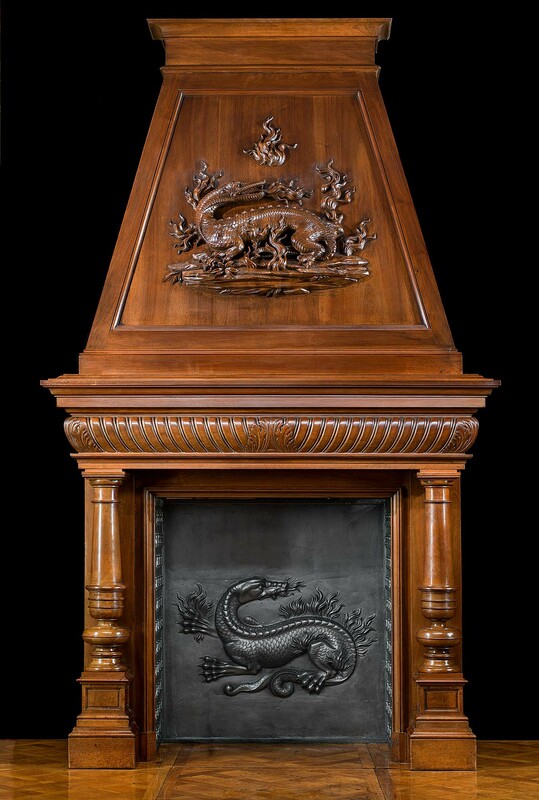 Made in France in the late 19th century, the walnut trumeau chimneypiece features two representations of the salamander engulfed by flames. Strikingly similar to the salamanders embellishing the grand Fontainebleau Palace, these emblematic creatures bear little resemblance to a salamander, and instead resemble a dragon, covered in scales and breathing fire. 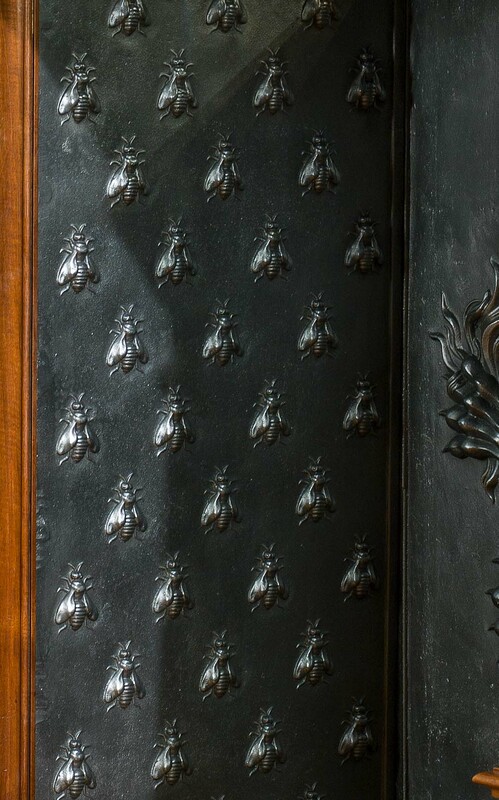 In addition to the salamander, the original cast iro back plate is enriched with bees on the side panels. Again, this is known to serve a powerful symbolic function. Napoleon Bonaparte adopted bees as his emblem after his ascension to Emperor, bringing legitimacy to his imperial pretentions. In fact considered the oldest emblem of the sovereigns in France, the bee was chosen to link the new dynasty to the very foundations of the nation. The 4th century tomb of Childeric I had only been discovered in the 17th century, and with it, a vast array of fine jewels, including bees carved from precious stone and finely tooled gold. Childeric I was one of the first Merovingians, who had conquered the Visigoths, Saxons, and Alemanni to establish much of Francia: now France. The association with one of the founding fathers of the French nation was a powerful one for Napoleon, and bees, much like the salamander appeared not only in royal palaces but in the homes of aristocrats. We surveyed 2000 people and discovered that huge numbers of people aren't getting the best deal on their energy. Only 38% make the effort to shop around on comparison sites to find the best rate, while the remaining majority endured an average loss of £180 per household, per year, which went up to an average of over £200 in areas such as the North East and Yorkshire. That means that the majority of people in the UK are paying almost 20% more on gas and electricity than they need to. For more about Westland's antiques you can browse their antique fireplaces, sculpture and more here. The story begins in the Mesoproterozoic age, long before any vertebrate creature walked the Earth. The soft white sediments of the long lost, warm Tethys sea, metamorphosed, folded, twisted and refolded into smooth knots of fine lustrous, sphered, symmetry. Bands of impurities take on beautiful colours, a profusion of shapes and forms. This is Marble in all its infinite variety. Scorched by the immense heat of nearby igneous intrusions, some becoming bleached and brightened into gleaming luminescent white marble. Thrust up to form the hills and mountains of Makrana, Paros and Carrara. We now move forward countless millennia. 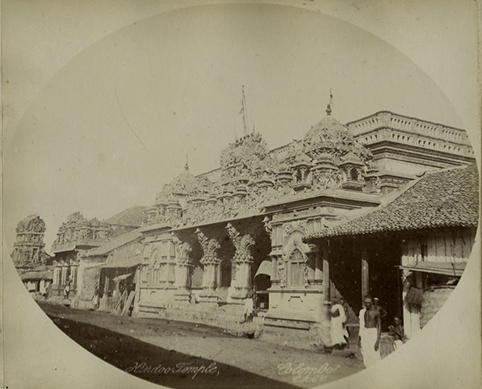 The scene is set for building of one of the first Hindu temples, the foundations of which are hewn from the solid rock. A myriad army of slaves toil, beneath the blazing sun, harnessed to huge blocks of gleaming white marble on rafts and rollers. Now for a change of scene, we move to ancient Egypt. There is the same blazing sun bearing down, the same burning earth another army of slaves toil. Once again it is marble gleaming and white in the midday sun, once again it’s the building of a temple. We go forward another three thousand years. Now is but a remote memory, but the sun baked land is littered with the ruins of past civilisations. Dig where you will and you will unearth marble Gods, marble columns, an obelisk. Then blooms the imperishable beauty, the flowering of Greek Art in a profusion of marble. The stone taking on a new life, to live once more under the genius of the artists touch. A profusion of great pedimented, marble columned temples, to the new Gods. The temple of Zeus, Olympia, the Parthenon, Athens , the Gods of old all but forgotten. Their temples lie in ruins amongst the baked dunes beneath the same blazing sun. Another people, another Empire is born. Toiling up the steep Capitoline hill of Rome, the oxen bear a statue of Claudius, carved from a single block of freshly hewn, purest white marble, stands dazzling and white beneath the deep blue of the Italian sky. Echoing the Roman metropolis, that is marble Rome in its prime. Its marble temples, its marble theatres, its marble monuments, its marble baths, its marble tombs. Once again we move forward two thousand years. In the history of marble what is a thousand years? We now live in the confusion of modern things. Machines are building vast steel and glass towers, towers to house the workers, the once deep blue skies bear the scars of our frenetic new metropolis, all that is natural seems forgotten. But still the backdrop for this last scene is the same. Still rising like wildly twisted snowdrifts are the mountains of Nagaur, Paros and Carrara. Still from these white hills can be seen distant harbours, with ships of gleaming white marble bound for distant shores. Much of the history of the Earth is to be read on these stones. 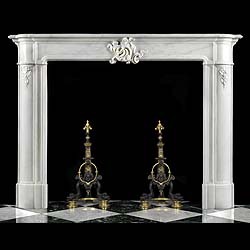 We have a wide range of marble fireplaces here at Westland London, so please visit us to find out more. A large collection of architectural sculptures removed from Number 1 New Change, The Cheapside, City of London, the previous Annexe of the Bank of England. In these times of ‘credit crunch’ and hostility towards banks and bankers a major collection of Architectural Statuary acquired recently by Westland from the Bank of England, City of London, evoke a period when the world of finance could inspire national pride and global respect. 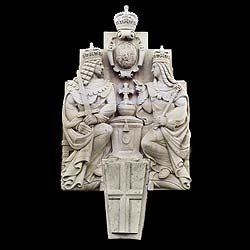 Illustrated are examples from this collection of carved Portland stone architectural high relief sculpture, designed to decorate the exterior & interior courtyard of New Change buildings opposite the baroque splendour of Sir Christopher Wren’s St Paul’s cathedral and completed in 1960 by post-war architect, Victor Heal. This understated complex of red-brick office buildings, which housed the Accounts department of the Bank of England, was demolished in 2007 to make way for the less modest, 21st century, glittering shopping centre by French architect, Jean Nouvel.
" 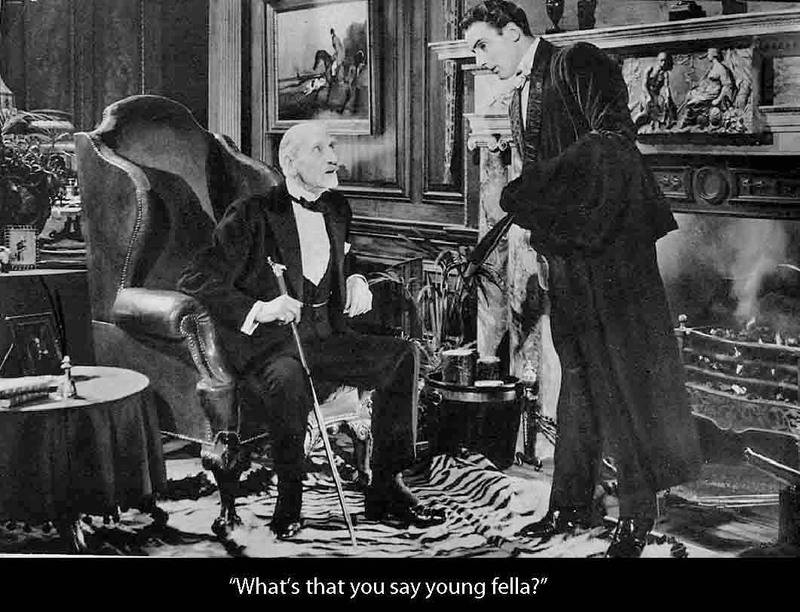 I PROMISE TO PAY THE BEARER..."....IDEALISM , CAPITAL GAIN AND " BROAD SUNLIT UPLANDS" ..W.S.Churchill. 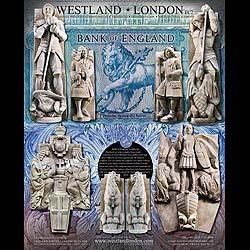 Bank of England Sculptures: Illustrated are some examples from a major collection of carved Portland stone architectural high relief sculptures recently acquired from the Bank of England Annexe in the City of London. 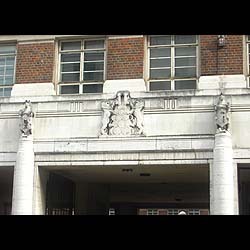 Installed in the 1950's and carved in the Art Deco & Baroque manner by sculptors: Sir Charles Wheeler, President of the Royal Academy, Donald Gilbert, Esmond Burton and others. The antique sculptures represent and symbolise the 17th century founding, majesty, abundance and the dynamic spirit of Credit and Trust around the World aspired to by the Bank. 10764. THE NEW "OLD LADY OF THREADNEEDLE STREET." Circa 1957.Sculptor: Sir Charles Thomas Wheeler, President of The Royal Academy, 1956-66. 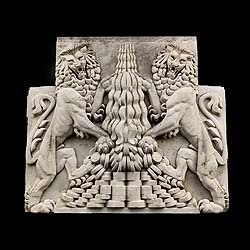 This is a smaller version of the 1934 Art Deco sculpture which remains over the main entrance of the actual Bank of England, Threadneedle Street: also sculpted by Sir Charles Thomas Wheeler. 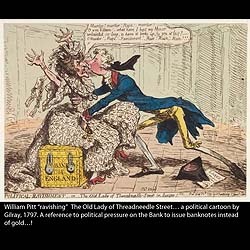 The term "The Old Lady of Threadneedle Street" first appeared in print as the caption "Political Ravishment or The Old Lady of Threadneedle Street in danger" to a cartoon published in 1797 by James Gillray. It depicts William Pitt the Younger, the Prime Minister of the day, pretending to woo the Bank, which is personified by an elderly lady wearing a dress of £1 notes seated on a chest of gold...to use banknotes instead of gold. An early example of quantative easing. The city dagger in the cartouche held by the gryphons forms part of the coat of arms of the City of London. The design combines the emblems of the patron saints of England and London - the cross of St George with the symbol of the martyrdom of Saint Paul. The griffin, griffon, or gryphon is a legendary creature with the body of a lion and the head and wings of an eagle. 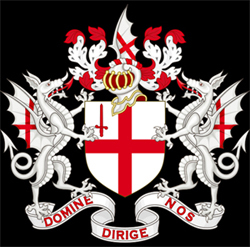 Associated with kingship, griffins are known for guarding treasure and priceless possessions; hence its iconographic value for the City of London. Sculptor Donald Gilbert. Circa 1957. Provenance: Our fearsome Bank of England lions guarding a fountain of coins: originally in the South Courtyard of the Annexe. Carved in the Greek Revival manner, Midas grasps a frothing cornucopia of gold coins. Paired with Stock No 10736 above the archway entry to the courtyard on Bread Street of the Bank of England Annexe in the City of London. Sculptor Esmond Burton. Circa 1957. Originally paired with Stock No 10737 above the entrances on Bread Street of the Bank of England Annexe the Bon Viveur Bacchus, god of wine and pleasure, is accompanied by a satyr offering him a hog’s head feast..
10734.THE BANK OF ENGLAND: A MASSIVE CARVED PORTLAND STONE TABLEAU DEPICTING WILLIAM & MARY (1689-1702) - THE GRANTING OF THE BANK OF ENGLAND'S CHARTER Sculptor Esmond Burton. Circa 1958-59. William of Orange from The United Dutch Republic, with his wife Queen Mary Stuart , daughter of James II of Scotland & England were " called to the throne " to become joint rulers of England , Wales, Ireland and Scotland, aka Great Britain, later United Kingdom, by Parliament, subsequent to the "Glorious Revolution. Together they ushered in a very progressive period for the nation, its institutions, economics and its democracy. Sited above the Cheapside entry to the courtyard of the One New Change building in the City of London, the frieze symbolises the Granting of The Bank of England's Charter by the monarchs. The Group included statues of Sir John Houblon the 1st Governor of the Bank (10747), Michael Godfrey the 1st Deputy Governor (10748), two City Gryphons (10746 & 10749) & two monogrammed keystones WMR 1694 & EIIR 1958. Sculptor David Evans. Circa 1957. Sculpted in the Art Deco Egyptian Revival manner, the lions guard a store of British coins - from a farthing decorated with a little wren at the top to the valuable guineas below. Provenance: Originally one of three sculptures above the Watling Street carriageway to the South Courtyard, flanked by a pair of unicorns on either side, (Stock Nos 10740 & 10741). Representing the prime River God of the English nation: ' Old Father Thames keeps rolling along, down to the mighty sea’ - Raymond Wallace. 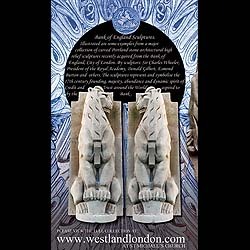 The great source of London’s existence, trade and economy, its strategic position has supported human activity from its source to its mouth for thousands of years and as a major highway for international trade through the Port of London. This keystone was above the central bronze door of the main entrance of One New Change. 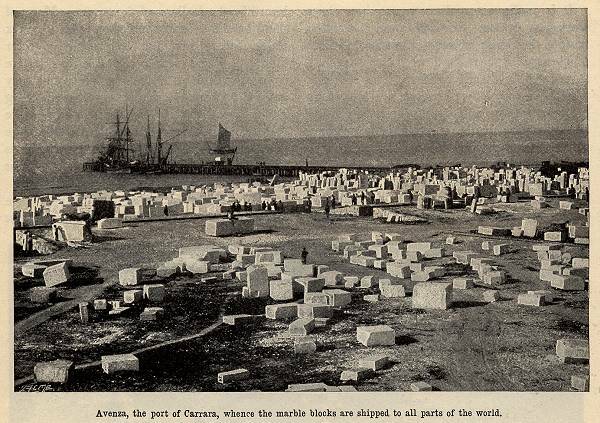 Bulletin, July 2010: Provenances & Air-Fer-Mer, Plane, Train, Road Ship and Mule miles. 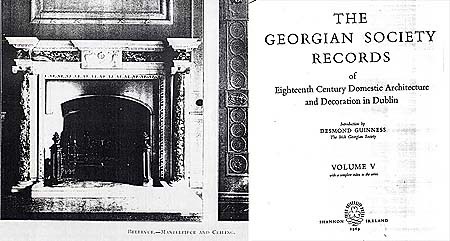 TRACING THE ORIGIN OR PROVENANCE OF Antique Architectrual Features and elements such as antique fireplaces and chimneypieces from thier original location can prove difficult and time consuming, even when investigated by experienced researchers familiar with the tools, sources and routines which are effective. Not infrequently however we are given or find clues that either identify or point the way to the original installation location as many of these items are relocated at various intervals in their lifetime. 7436 : ONE EXAMPLE OF IRREFUTABLE VISUAL PROOF of provenance is the case of our sold stock no 7436. This antique French Louis XV rococo fireplace mantel was removed during the refurbishement of a large house in Essex. We restored, photographed and put images on the website. 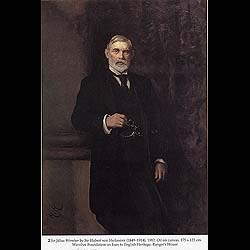 A month or two later we saw an article in a magazine on Sir Julius Wernher who was a major figure in the Kimberely Diamond Fields, one of the Randlords, and a great collector of antiques and works of art. A large part of his collection was displayed in his London Residence at Bath House, 82 Piccadilly in Mayfair..demolished in 1960. 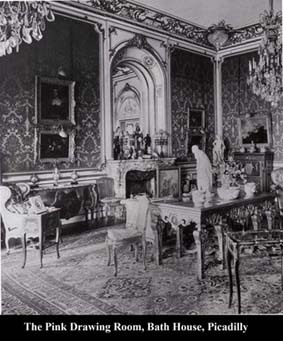 A photo in the article showed the Pink Room, and there unmistakeably was the large French Rococo marble fireplace which at the time was displayed in our gallery. The redecoration of Bath House was carried out for the Wernhers by the renowned French decorator and Architectural Antiques Dealer, Georges Hoentschel. Shortly after the article appeared it was bought from us by a charming enthusiastic couple from Cincinatti, Ohio.... and incurred airmiles. 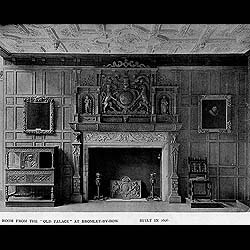 9061 WAS A LARGE OAK PANELLED ROOM COMPLETE WITH CHIMNEYPIECE which we removed from Kirkdale Manor, North Yorkshire which was built for the Beckett family at the turn of the century. 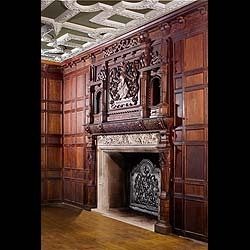 The vast Carved oak ELizabethan / Jacobean chimneypiece with overmantel and part of the ensuite also Jacobean oak panelling were replicas of the original English Renaissance fireplace mantel and panelling removed from the 16th century Eliazabethan builidng known as The Old Palace, Bromley by Bow in 1894. This was despite great public outcry orchestrated by Charles Robert Ashbee, against the demolition of the venerable Old Palace and the later relocation of the chimneypiece and part of the panelling to the Victoria & Albert Museum, South Kensington at its opening in 1906. 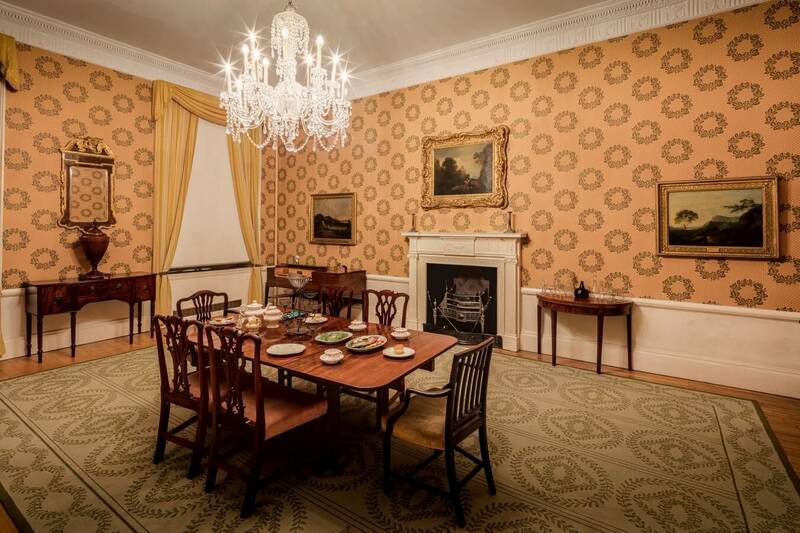 This room was installed in the new museum and can be viewed there to this day. In fact much of the panelling removed by us from Kirkdale proved to be 17th century, therefore probably original to The Elizabethan built Old Palace, which earlier in its life had served as King James 1st Hunting Lodge. This magnificent suite has been installed in a London project....About 300 road miles in all. 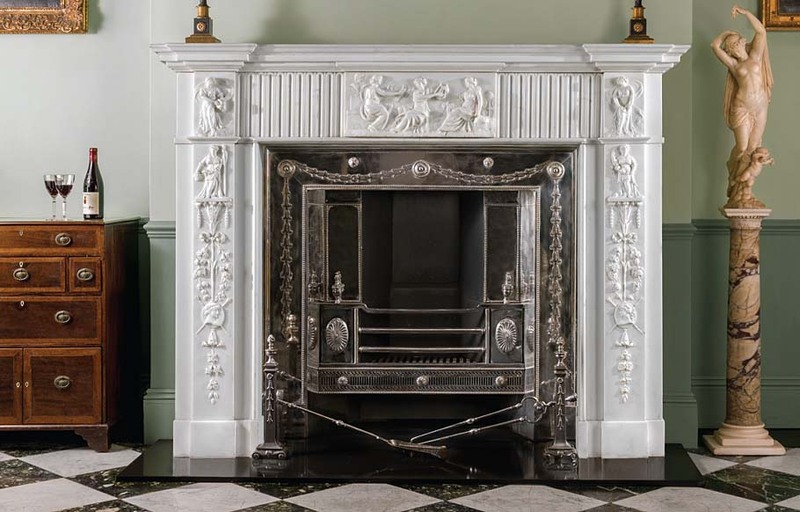 4523….THIS VERY FINE GEORGIAN NEO CLASSICAL CHIMNEYPIECE was removed from a house in Scotland but had originally been installed in Bellevue House, County Wicklow, Ireland, which was built by David Latouche in 1754 but allowed to deteriorate to its present ruinous condition. Latouche was a Hugenot and founder of the merchant bank Touche, now Deloitte Touche. This original provenance was only discovered much later when we saw an entry in the Irish Georgian Society Records published in 1909. See image above. This one does have bountiful Air Miles, it went to Kyoto, Japan. THE CHATEAU AU MAQUIS DE LA VALETTE CHEMINEE.... A very, very large Louis XV Rococo carved stone antique fireplace mantel on which the particularly grand and noble styling befits the Provenance of this 19th century replica. It was made for the rebuilt chateau of the 17th century original which was destroyed by fire during the revolution. 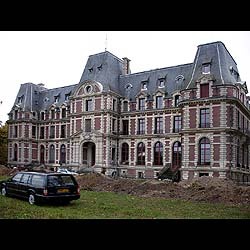 The original Medieval chateau and domaine of the Marquis de Valette at Pont St. Maxence, 50 miles north of Paris was severley damaged during the 1789 French Revolution . It was rebuilt in the same style in the 19th century – see present day images above and alngside. 8282 : This chimneypiece was removed to safe storage early during World War II when the German Wehrmacht garrisoned troops in the Chateau. It was never reinstalled.The Marquis de Valette accompanied La Fayette on his American adventures during the War of Independence. Truck miles Isle de France - London. Air miles to Florida. 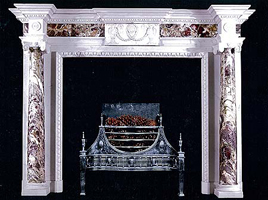 6303 : LORD PEEL'S ANTIQUE CHIMNEYPIECE FROM GROSVENOR SQUARE : Lord Peel, a descndant of Sir Robert Peel the great reformer and a Cabinet Minister had this house redecorated in the late 19th century, probably like Wernher also by Hoentschel the Parisian decorater and supplier. Whoever did this redecoration supplied a pair of very finely carved and substantial English marble antique chimneypiece in the grandest Rococo Revival manner. An irrefutable proof of provenance for this impressive piece with its exquisite oval 'putti' central plaque was discovered by us in a survey of great London houses, showing it in situ in the Rococo decorated drawing room at Lord Peel's town house. Much later this decor was changed and the chimneypiece came on the market. Here it is shown in our Chapel Gallery displayed against a large panelled oak room in the Queen Anne, Baroque manner with carved panels reminiscent of Grinling Gibbons carving. 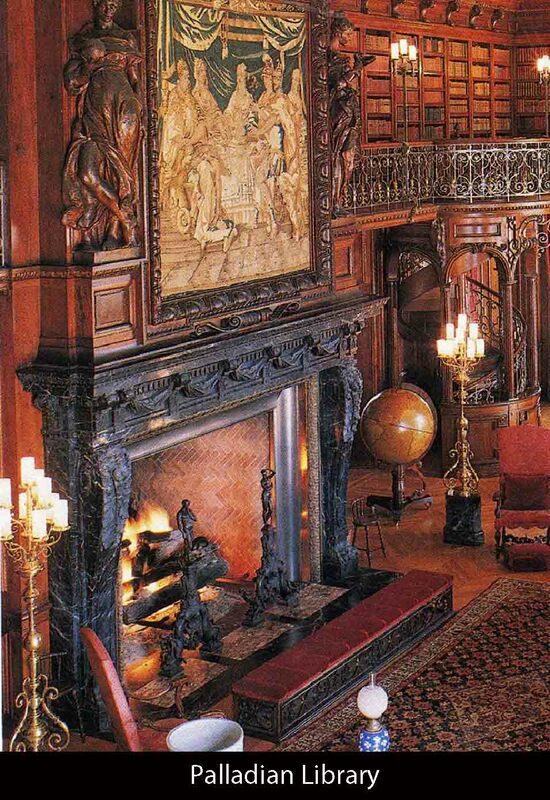 This rich chimneypiece went to Dallas , Texas....by air. LEADS TO AN INTERESTING HISTORY OF 7927 were discovered in a March 1960 copy of the now sadly extinct Antiques magazine “The Connoisseur”. The information gleaned from this established at least two, now three relocations. 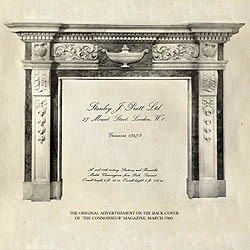 Displayed in a monocolour advertisement on the back cover of the magazine by the renowned fireplace specialists Stanley J Pratt, founded in 1860, was this very chimneypiece exhibited at the time in their gallery at 17 Mount Street, Mayfair. Over many years successful trading Pratt and various partners and sons had galleries in various locations apart from Mount Street in central London including The Brompton Road and The Old Brompton Road, and to judge by their inspiring publicity they traded prolifically in the best in period chimneypieces and other Architectural elements. Their advertisements progressed and improved in line with the quality and variety of their traded stock. First in black and white and latterly in colour in such magazines as The Connoisseur and over a large part of the early to 2nd half of the 20th century. A worthy role model for aspiring Chimneypiece specialists. 7927, BAGNOR HALL OXFORDSHIRE : A George II Statuary and Sienna English carved marble antique fireplace mantle originally in a house in Bath, Sommerset, a breakfront shelf with egg & dart & dentil undershelf above high relief carved urn endblocks and central plaque with accanthus floral decoration on the side panels above accanthus leaf corbals and descending floral decoration. Provenance: Bagnor Hall, Oxfordshire. English, circa 1750. From the 17th to the 19th Century the Romance and Adventure of the European Grand Tour grew as a phenomenon during which many younger members of English Scottish and Irish Gentry and Scholars, also those from other Northern European countries, sought or were enjoined by their elders to study and experience the grand Antique Monumental Chateaux Castles Houses and Palaces, Schloesser, Landhaueser, Pallazzi, the ancient Artefacts and Archaeological Treasures of the Great European Centers of Civilization. Apart from the voyage or journey itself this was an adventure into antiquity , the ancient culture and traditional heritage that were to be seen through Northern Europe, The Cathedrals and Temples,the Great Estates and Roman ruins of Flanders , France , Germany, on to Dalmatia but above all in Italy, in Florence,Venice, Rome and Naples, and later in the 19th century to the Balkans, Turkish occupied Greece and the Ancient Greek ruins of Western Turkey itself. There was a constant traffic, 6000 travellers from England, Scotland and Ireland alone, interrupted from time to time by wars and religious confrontations, of wealthy focused travellers. The effect in Italy was considerable and beneficial to a all concerned. Firstly the support and patronage to artists, sculptors and artisans which traditonally had come from the Papacy and the Italian nobility for the creative abilites of skill, design and workmanship was now provided from the 17th century by these informed enthusiastic and financially substantial long and short term newcomers. This undoubtedly resulted in the revival of the fortunes of these talented Italian Scultori, Mosaicista, Painters , Woodworkers and Gilders, and in the process admirably facilitated the spread of breathtaking Italian Classical inspiration and sheer enlightened creative talent to the great benefit of Northern European civilization and thence to Russia and the USA. One area of the gradual growth of interest and patronage of visitors from the British Isles, from Inigo Jones in the late 17th century right up to Thomas Hope in the 19th century were the “… modern chimneypieces which are for sale in Rome which are of good taste, and the rarest of marbles which are introduced in them, particularly fine slabs of Egyptian Porphyry ” reported by early Grand Tour English visitors. Sourcing these rare marbles caused the later renowned artist , designer and entrepreneur Piranesi to join forces with Gavin Hamilton, a young Scottish nobleman, in the excavation of quantities of marble, decorative elements and fragments from the marshy Pantanlo area of Hardian's Villa at Tivoli. 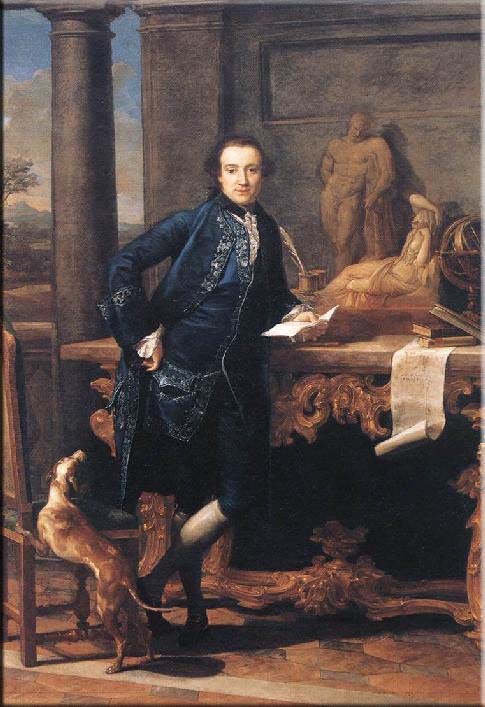 Hamilton, later Lord Hamilton was a talenrted portrait artist and also served as one of numerous buying agents of antiquities for visiting British Nobility and Landed Gentry. 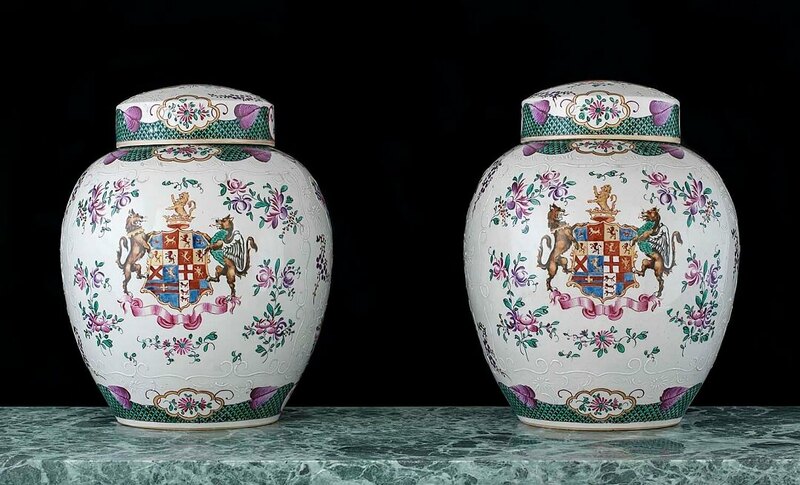 One of Hamiltons clients was Charles Townley, another passionate Antiquarian who assembled the famous Townley collection of statues , vases and elements from Antiquity which were later purchased for the fledgling British Museum. See room 83 , Roman Sculpture. 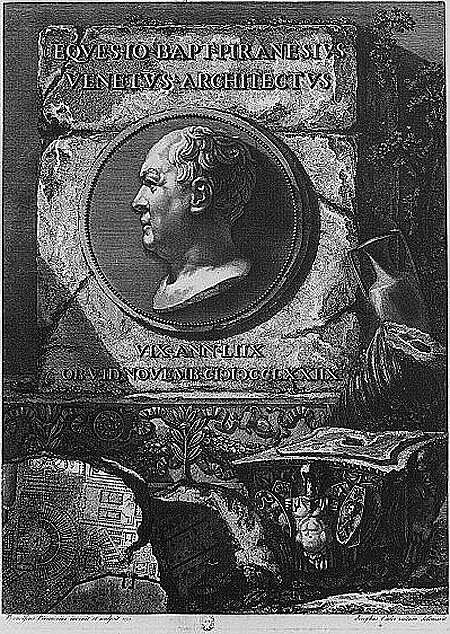 Giovanni Battista Piranesi was an Italian Artist, Printer of Art Works and designer whose studio in the Via Sistina in Rome was frequented by many Grand Tourists and resident cognoscenti from England Ireland and Scotland etc to supply the growing demand there by the Gentry for superb Chimneypieces. 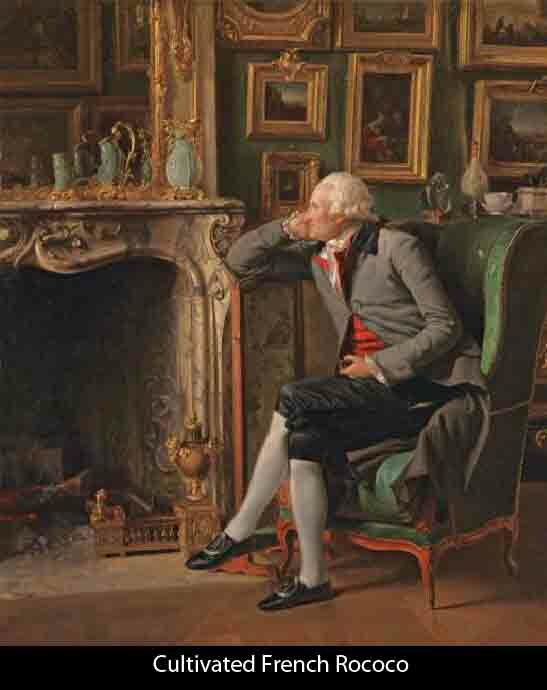 In the mid 1760s he had built up a network of specialist sculptors, dealers and agents for the production of fine mostly Neo Classical, which we now call Georgian, chimneypieces. 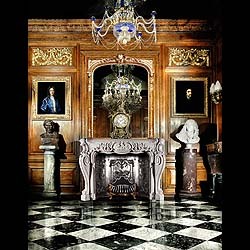 Sometimes incorporating antique marble or bronze fragments and rare marble inlays such as those at Burghley House Lincolnshire in Grand Tourist Lord Exeter's Neo Classical restructured rooms, at Palladian Gorhambury House in Hertfordshire and in Wedderburn Castle in Scotland, designed by Robert Adam who also was known to and worked with him. " ..the best of the fireplaces are by Piranesi." 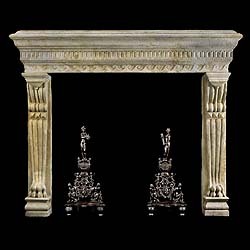 Our stock no 10151 “Rare and important chimneypiece“ , this antique Palladian period fireplace is typical of design by Piranesi of chimneypieces produced in the late 18th century in this way. The typical features are of low relief intricate repetitive carving , the higher profile main features and the highly prized Egyptian Porphyry marble which would have been salvaged from ancient Roman elements within or outside of Rome. The other image on the right shows a similar one documented to have been made in Piranesi’s studio and delivered to 52 St Stephens Square, Dublin the town house just built in 1776 for David La Touche the Hugenot Banker, later Deloitte Touche Tohmatsu. 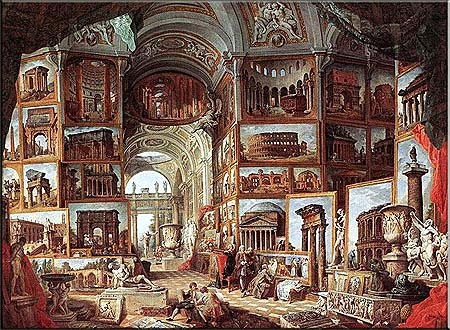 The desirability and availability of exquisite creations through the discoveries of The Grand Tour resulted in an ongoing traffic in many fine newly made chimneypieces as well as many earlier antique examples, not to mention the antique archaeological and architectural elements, busts and sculptures, paintings and so on. This to the extent that many of the Great Houses of England Scotland and Ireland had and still have literally thousands of notable and fine 18th and early 19th century chimneypieces which are therefore now in 2010, venerable antique chimneypieces, fireplace mantels, sculptures and other elements which had been made by those skilled artisans in their Venetian, Florentine, Roman or Neapolitan studios andd workshops in Italy itself. 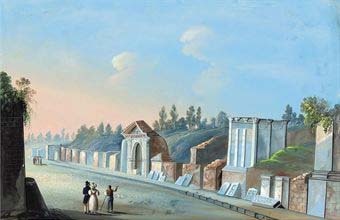 Later many also were commissioned to travel to the British Isles to carry out the work for the great Palladian Houses that were being planned and built in the 18th and 19th centuries for the Landed Gentry. 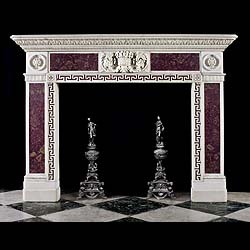 Examples being : The Piranesi designed Chimneypiece for Lord Exeter at Burghley House. 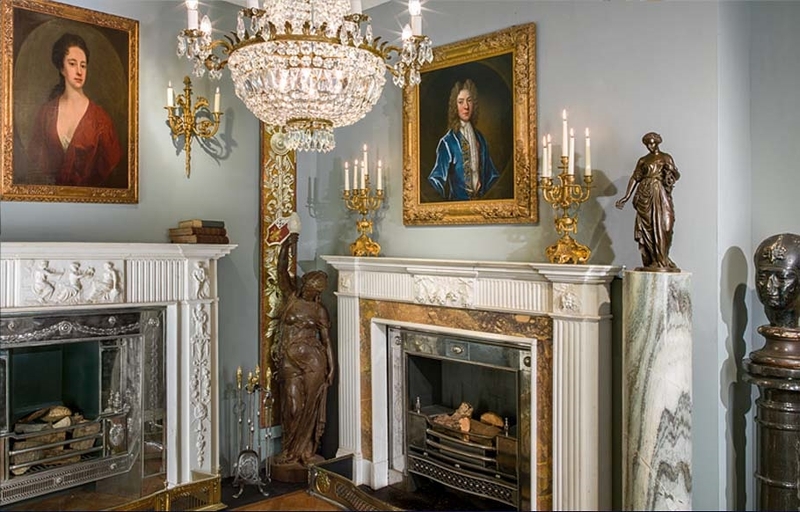 Another fine Pophyry mounted Chimneypiece at Paxton House, Berwick on Tweed, and the previously mentioned one for Wedderburn Castle in Scotland, this last one bought by Patick Home, Scottish aristocrat, in Italy from Piranesi. 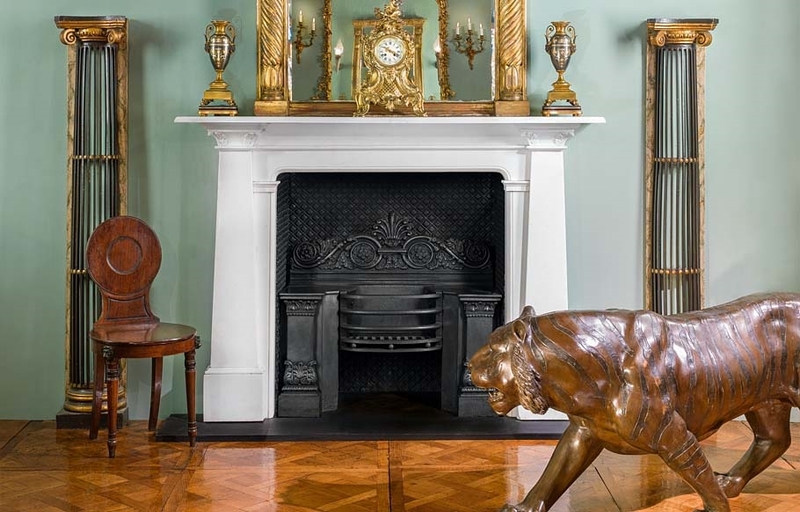 We can be forgiven for assuming and indeed describing these superb antique chimneypieces and their lesser cousins as being English, Scottish or Irish but they were in fact mostly made in Italy, albeit frequently to the informed clients requirements. These attributions therefore denote the tastes and locations of the British purhasers who were usually concerned in the design which frequently used features and elements from Roman Antiquity. Initially the manufacture was just "on spec" by the Italian sculptors and other craftsmen, but later to order through the great designers, decorators and agents such as Piranesi. It progressed to later when the works were executed also by British and other Northern European Sculptors craftsmen or artists working in Italy such as Christopher Hewettson, 1736-1798, the Irish Sculptor who worked in Rome and Joseph Nollekens, the Anglo Flemish Sculptor. Here are two examples from Westland's present inventory of Antique Italian Chimneypieces made before the advent of the Grand Tour phenomenon and later brought back to England during it. 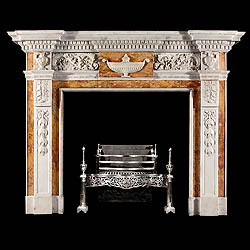 This antique Italian Baroque fireplace mantel would have been carved for an Italian City Palazzo property in the late 17th to early 18th century, purchased in Italy some time after , and brought to England. 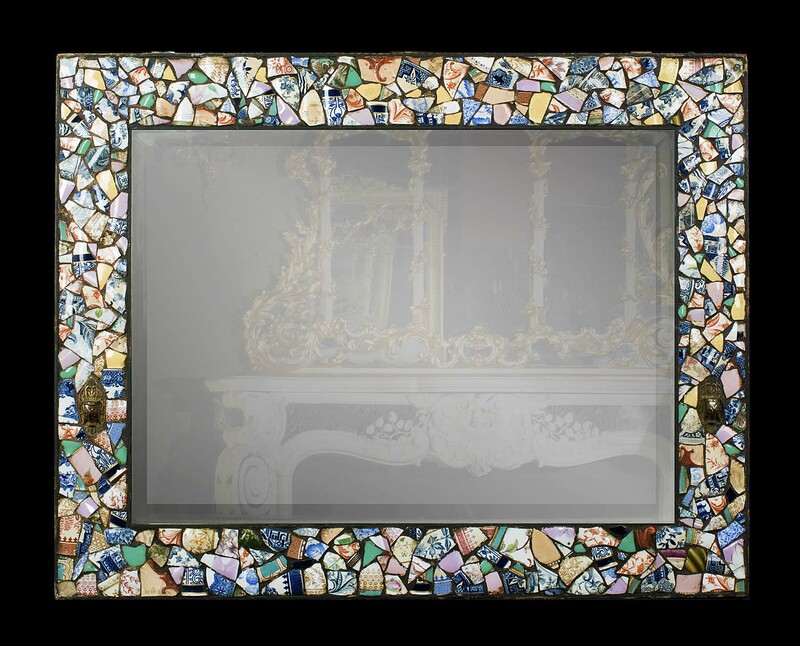 Of the late Baroque Period one can see its styling as moving towards that of the Rococo. 11198. 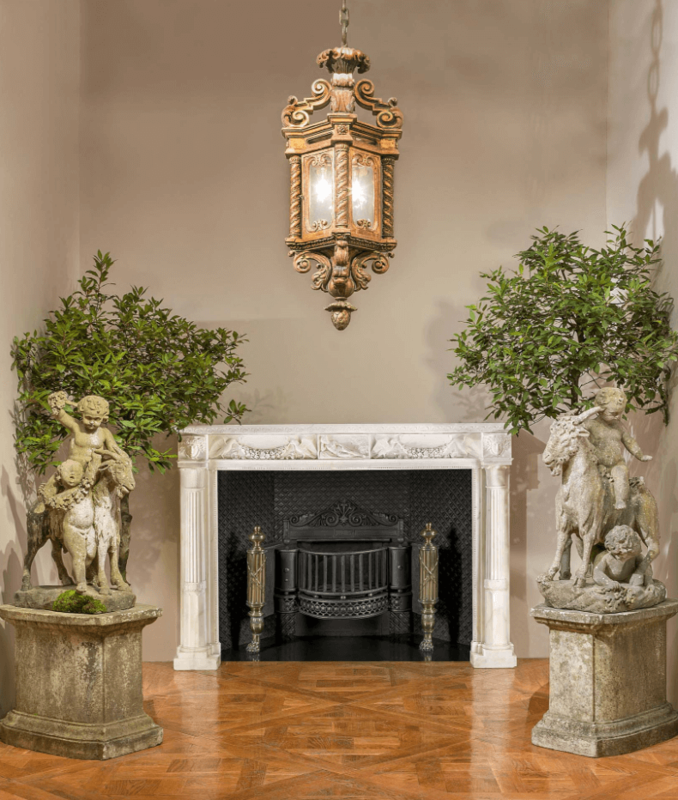 An original period elegantly proprtioned late Baroque Italian chimneypiece in white Statuary marble from the Lombardy region, carved in three sections from the solid. The shelf is with a neat moulding carved into the integral panelled frieze, which is decorated with a typical assymetric large central stylised floral cartouche / motif, flanked by further smaller floral motifs on the upper jamb panels, all carved from the solid. Italian, early 18th century. This large antique Italian carved stone antique fireplace mantel dates from the 16th century and would have been bought from a Venetian demolition and therefore not expressly made for export. 10419. A RARE & LARGE PERIOD VENETIAN RENAISSANCE Camino in carved limestone. The substantial top section with a stop-fluted gallery over the Vitruvian scrolled carved Lintol supported on scrolled brackets over fluted jambs with lion paw feet on baluster footblocks. Italian circa 1560. 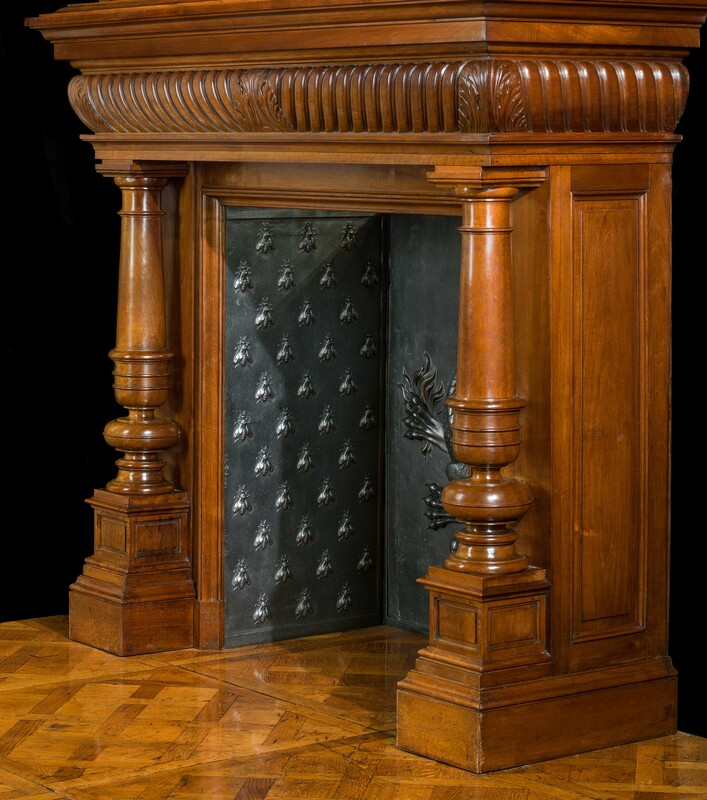 Referred to as fireplace, mantelpiece, or chimneypiece... kamine, camino, cheminee or chiminea, the antique fireplace is an important prominent architectural as well as decorative feature in the interior of not just the traditional home. It either sets the style or complements the existing setting of the room or building itself. 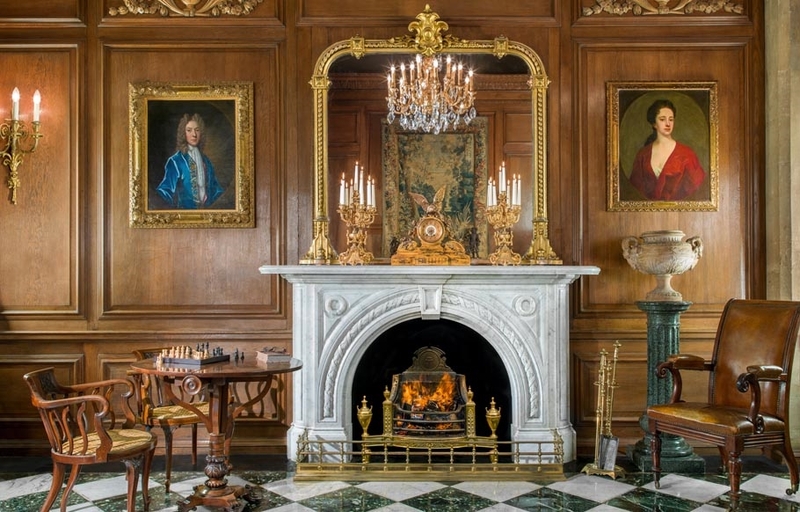 For many people there is a simple but deep seated satisfaction…even Mystique...felt in the presence of an antique mantelpiece that is in fact an Edifice in miniature itself. A structure that has endured the years ...or centuries...silent witness to bygone events and routines, dramatic and prosaic... of personages both notable and ordinary, poignant and joyful. 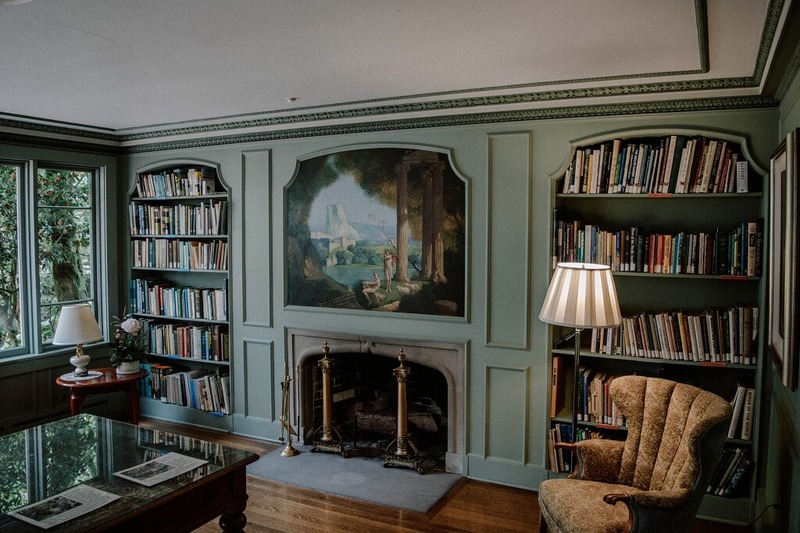 The presence of an antique Fireplace in an environment... grand or modest, formal or understated affirms the unconscious human need for connection with the positive, distant past. Visible evidence is presented of the validity and quality of age old crafts and skills, concepts of eternal design and beautifully worked natural materials ...all combining in silent testament to the continuity and harmony of the ascent of Man's Civilisation. 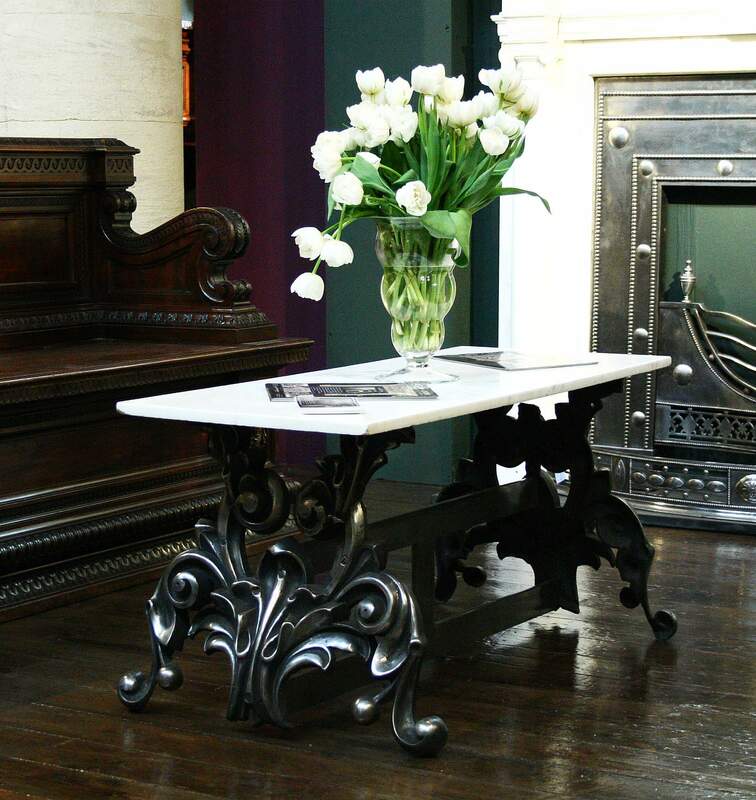 PERIOD AND STYLE TO SUIT THAT OF YOUR HOME AND THE INTERIOR DÉCOR. If you own a period home or a property of a particular period and style then you would normally prefer to choose a fireplace that matches or complements the period features. On the other hand you may wish to create an antique or period environmental style in a modern or neutral interior...either completely with furniture and fittings and chimneypiece blending to that effect...or in a completely plain or hi tech décor placing the one major traditional antique element, the chimneypiece. 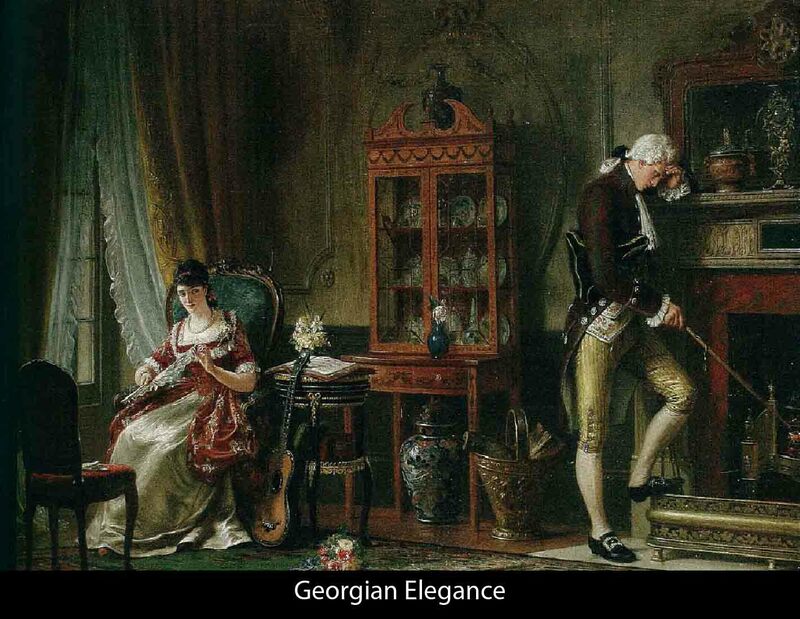 Over the centuries building styles and decoration fashions evolved and changed. There were transition periods long and short when one style evolved into the next and then there were less gradual changes where the next style bore no relation to any previous…This was the case when the exotic Rococo style arrived all over Europe. 11098 It was considered a most radical, even risqué movement...In London the avant garde exponents were based around St Martins Lane. Then again many styles were revived in later centuries and referred to as Revival or Neo, mostly in the 18th and the 19th centuries...These included Neo Gothic, Gothic Revival and so on... Jacobean, Renaissance, Baroque, Rococo, Palladian, Georgian, Regency Revivals. Therefore if you have a house of a particular period then a chimneypiece of the corresponding antique Revival or Neo period would serve well in the absence of an original "de l'epoque" as it also has a presence and patina, a history....a pedigree. For your contemporary, modern or even hi tech interior you should choose a style that appeals and pleases. The decorative design seen in the Antique Renaissance period featured much repetitive floral scrollwork , putti and deity figures intermingled with architectural detail. The Antique Baroque saw very imposing, grand, scrolled monumental features and facades, the Antique Rococo epoch saw floral, asymmetric, nature inspired sensual shapes and forms…whereas the Neo – Classical, Regency and French Empire periods saw more linier, geometric designs influenced by those of Greek and Roman Classical Antiquity but frequently with stylised natural and floral forms. At the Westland * London galleries, a vast and ever changing selection of antique fireplaces from all ages, period and styles are presented for the steady demand from professionals and individuals Worldwide seeking period antique statement pieces of varying degrees of uniqueness and splendour...along with a comprehensive stock of fire grates, fire dogs, and other antique fireside accessories, along with antique decorative and architectural elements, such as antique mirrors, lighting, fountains, panelled rooms, plinths, doors gates & windows, furniture and many more. 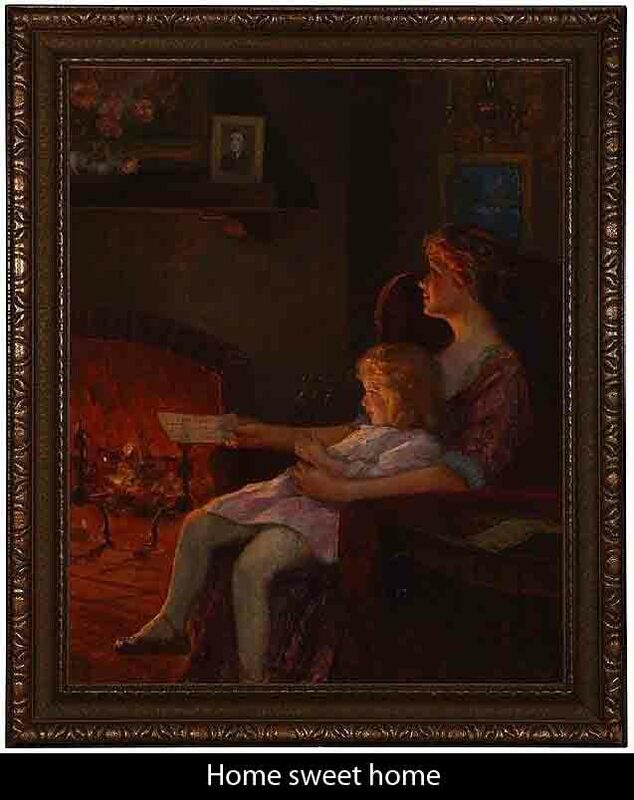 Choosing the right antique mantel for the right room in the right house can provide a growing continuous satisfaction as the environment is placed around it...as it settles in as the sentinel, the tabernacle at the family's center...the frame for flame...the focus...the statement. Be careful when choosing your fireplace that it matches the scale of the room...in height, width but also in depth, for rooms of modest size. Be aware of all relevant dimensions including those of the firebox and possibilities for alteration to accommodate a particularly desirable choice of antique mantel. Before building renovations pay great attention to the size and condition of the flue...and room ventilation...as this will determine the size of the opening of your chimneypiece so that smoke or fumes can escape up the chimney adequately. 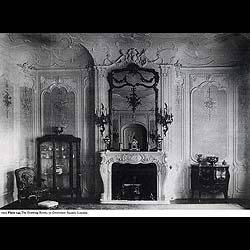 Antique English Rococo and Neo-Classical or Georgian fireplaces tend to be taller, often with a shallower shelf depth than most French cheminee’s from the 18thc onwards, except for the grandiose variety. The firebox can be lined with bricks...most attractively in the herringbone fashion, or simply in black dyed fireproof cement, or with decorative cast iron plates in addition to the fire back. If you already have a working fireplace you will either use gas or solid fuel. These days most antique grates, although built in the days when only coal or wood fuels were used, can be converted using a modern gas conversion unit, which can be controlled by a remote control. 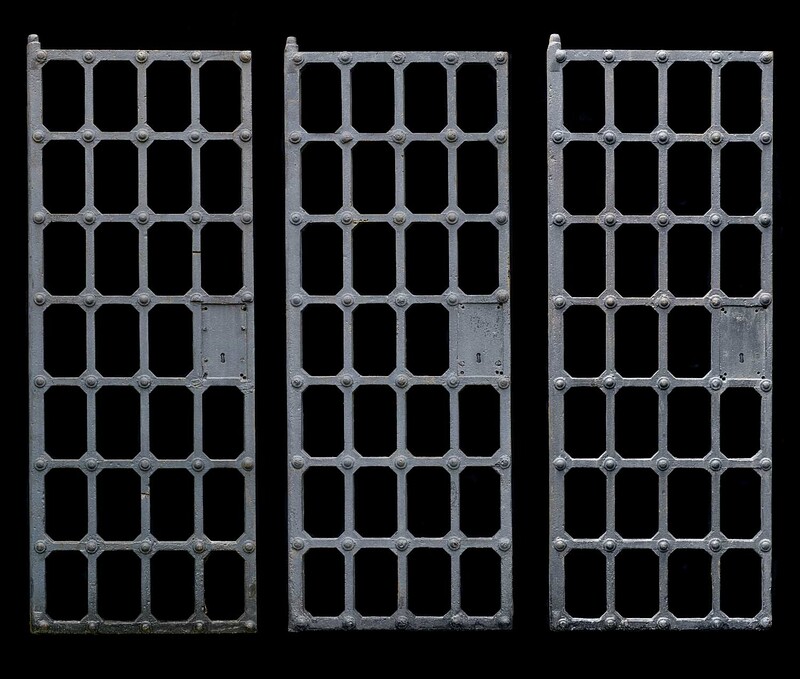 Antique Firegrates: Log grates or coal grates...of all kinds of designs...these were developed to confine the fire itself, and for heat efficiency fuel economy. Antique Hobgrates: These are another usually very stylish form of firegrate with a structure whereon pots or kettles can be stood to heat water or food. Antique Register grates or inserts: These are again very often quite beautiful and are even more economical and heat efficient and close in the whole firebox opening. Antique Andirons or firedogs: These are the oldest method of supporting logs within a firebox. The logs rest on the rear billet bars fronted by the vertical plain or ornamental firedogs which are protected from the burning logs getting too close by the frequently ornamental log stops. 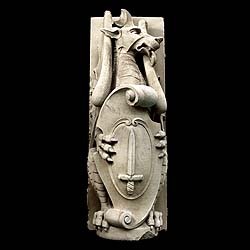 Antique cast iron firebacks: Usually highly decorated, frequently heraldic features...Shields, Latin mottos, Kings, soldiery and trophies protection of the brick or stonework, and provide heat radiation, even for hours after the fire has died. Antique fire tools: Pokers, shovels, tongs and later brushes...all for tending and controlling the fuel and ash in the firebox, not forgetting bellows to encourage the flames. Reviewing the above brief survey one realises what a variety of aspects are involved in this subject. Frequently people are fascinated and are drawn into the broad spectrum that is revealed....from the fundamental age old technology of the provision of heat and light, to the focus for social gatherings, the aesthetic design and sometimes symbolic aspects. 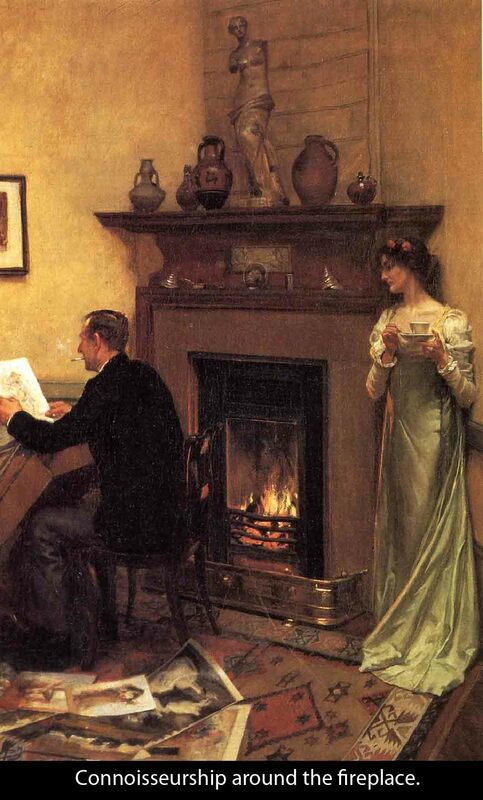 The relevance is that the antique fireplace, being such a centerpiece of indoor life should be regarded from an informed and opinionated standpoint, recognising and appreciating all its aspects rather than simply as a sterile, bland structure.